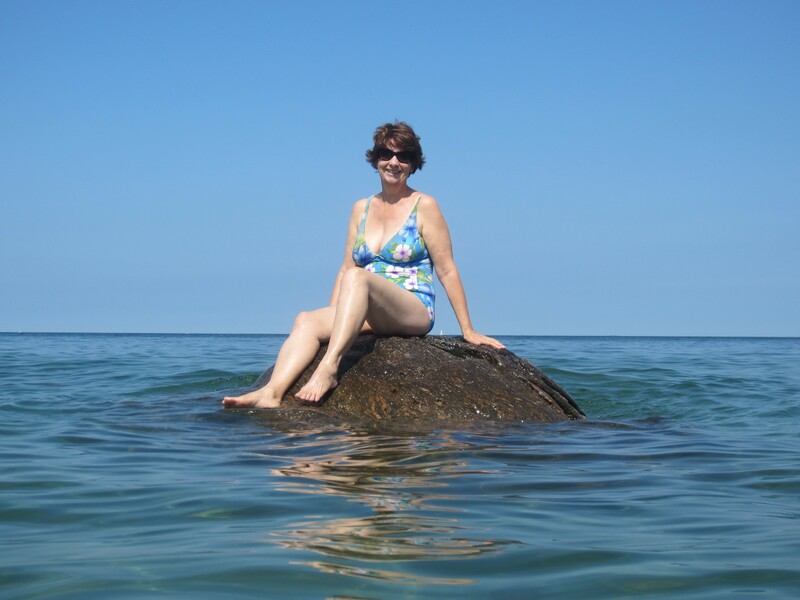 One Long Lovely Summer in Eastern Canada: Family Connections, Fond Memories and Fun in Nova Scotia! 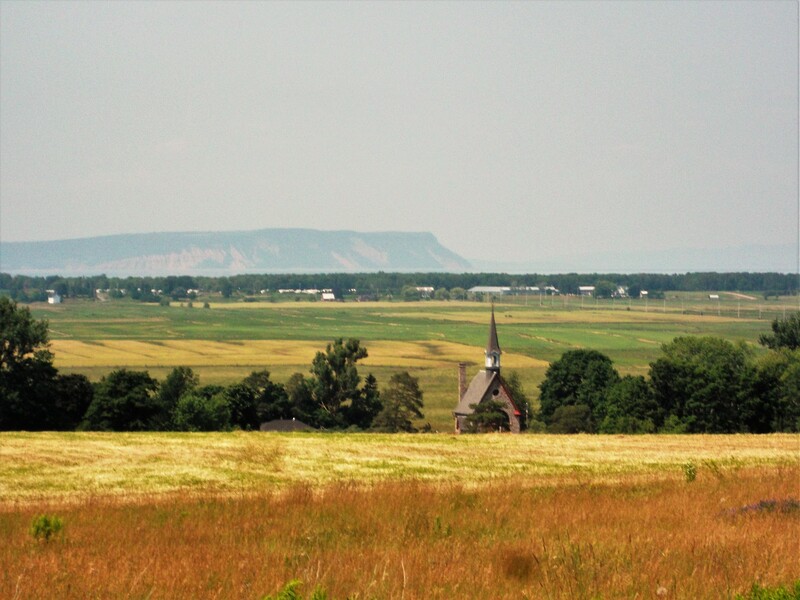 Distant Cape Blomidon,verdant fields among the protective dykes and the historic Grand Pre church with its dramatic Acadian history are prominent features in Nova Scotia’s Annapolis Valley. Whenever I am in Canada, I enjoy taking a trip ‘down east’, because I’ve got lots of good reasons to spend some time there! Aunt Vivian reads a birthday greeting aloud from my immediate family on her 91st. Her grandson Adam looks on, and other family members are listening nearby on this special occasion. year, per Vivian’s wishes, the gathering for her 91st was more intimate and family centred, and I was honoured to be a part of it two years in a row! 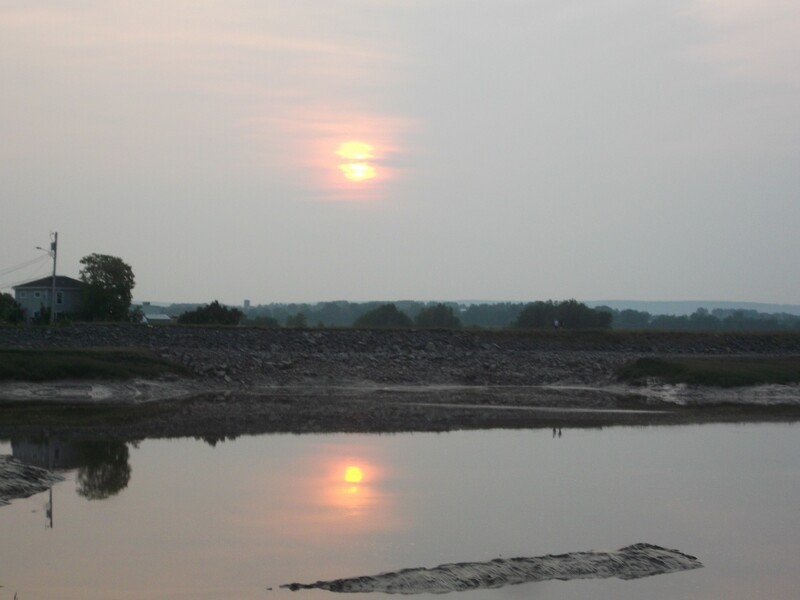 It’s fun to walk on the trails along the dykes near Wolfville, and take in the tides and the late summer evening sunsets! However, before I made my way to attend that special day, I first visited with my environmental health specialist, Dr. Jonathan Fox, M.D., whose office is located at Integrated Chronic Care Service in Fall River, a short drive from the Stanfield International Airport, which is north of Halifax. It’s always extremely helpful to consult with him, as his counsel helps me to better manage my environmental-based illnesses, whether in I am in Canada or Dominica. This facility is the only one of its kind in Canada, and I feel very fortunate to benefit from the services that cater to my specific health challenges. I am also grateful to Dr. Fox for his ongoing care through phone consultations, which aid me in maintaining an improved quality of life wherever I am situated. 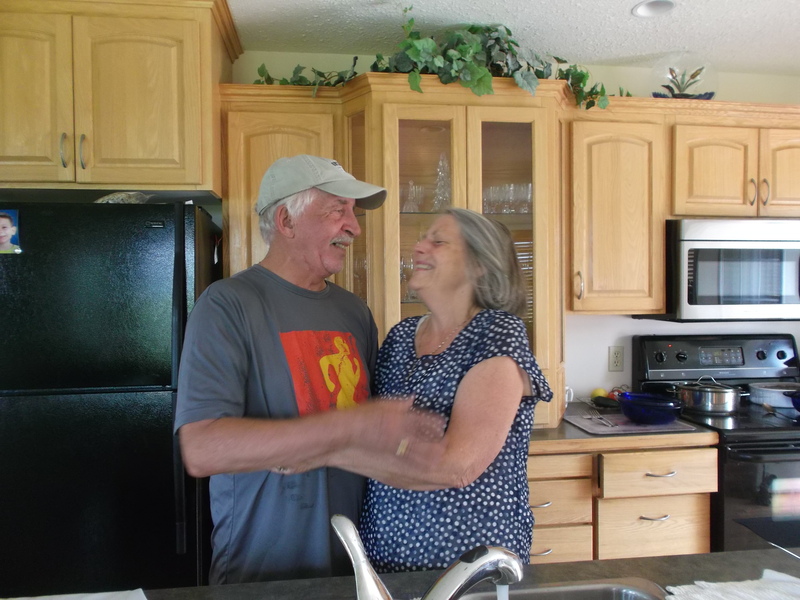 Cousin Dwight and his wife Patricia are my super-fun, high energy hosts. They’ve always got ‘something cooking’ that amounts to another great adventure for me! Wolfville is a thriving town in the Annapolis Valley and is the home of Acadia University, a small well-respected academic institution. 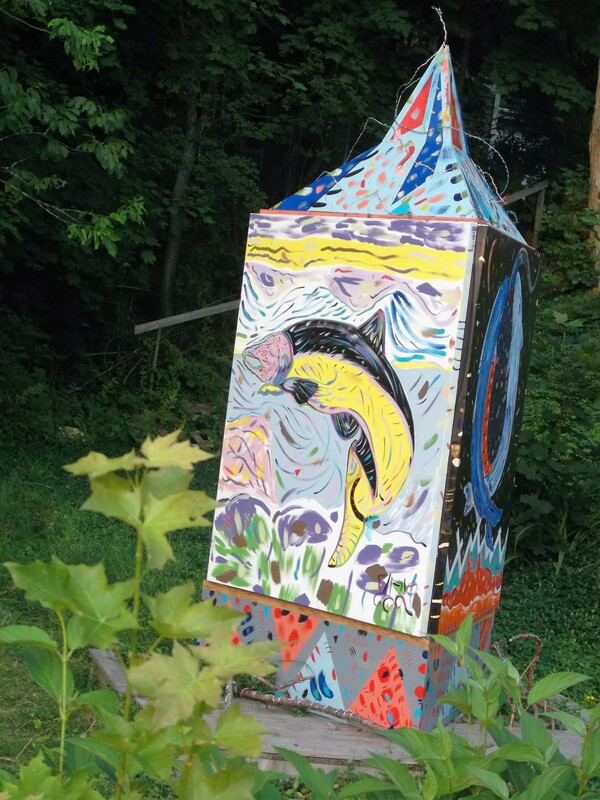 Folk art is a popular genre of artistic endeavor in Nova Scotia, as shown in Wolfville. sensitivities. It really helps to have their understanding and support and makes travel much easier when away from my home environment. Unfortunately, there is considerable pesticide application throughout the Annapolis Valley at that time of year, as it is a major ‘bread basket’ in Canada with its ubiquitous fertile soil and ideal growing conditions. Thankfully, my ‘relations’ are big on ‘organic’, ‘free-range’ and ‘non-toxic’, so I am definitely in the best company, for which I am very grateful! As usual, there were loads of incredible meals – most with seafood, as there is nothing like the ‘fresh fish’ that is readily available in this east coast province. I took my aunt on a road trip or two, to check out places once familiar and to visit some other relatives too. Then I was treated to a couple of excursions by my cousin Greg. He has a knack for venturing off of the main route to explore out-of-the-way places. 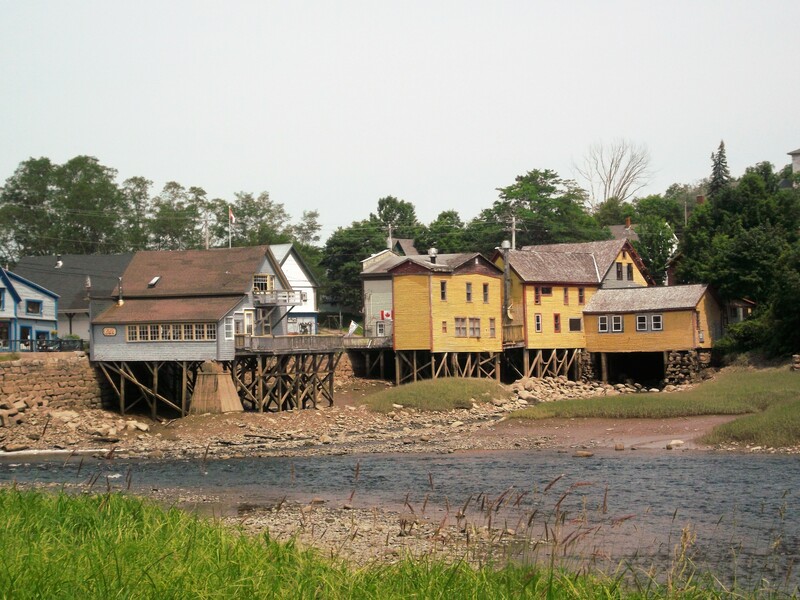 These houses are on stilts at Bear River because the Fundy tide can be very high at times. 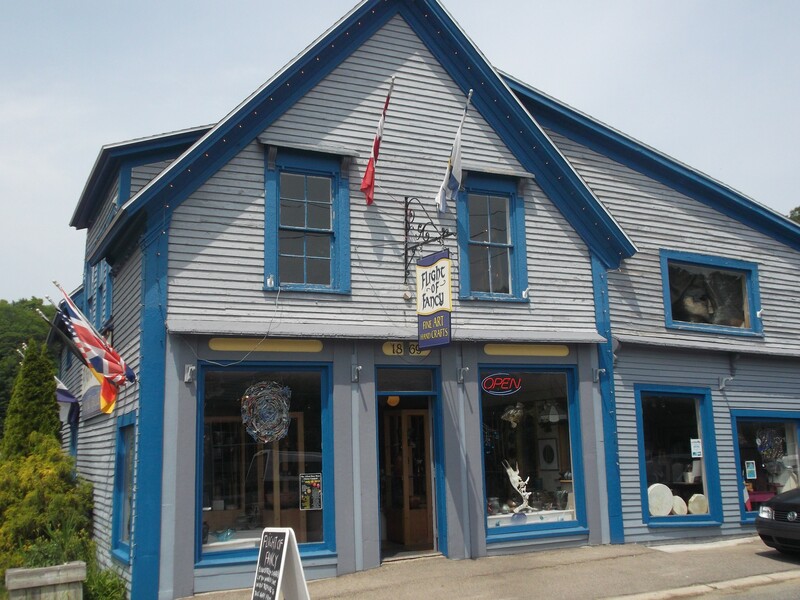 The quaint art galleries in Bear River contain exceptional works of art – in many genres. It’s definitely worth the drive off the beaten path to this pretty hamlet. 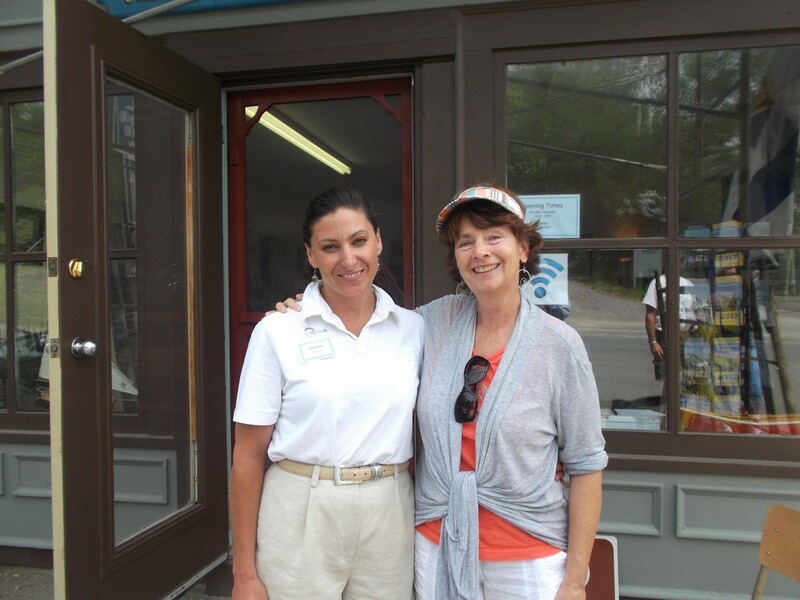 I discovered that it really is a small world when I met Simone (l) at the Visitor Information Centre in Bear River. Her parents live on the road to my favourite Three Little Cottages where I later spent a lovely 6 weeks, near Battersea Ontario. 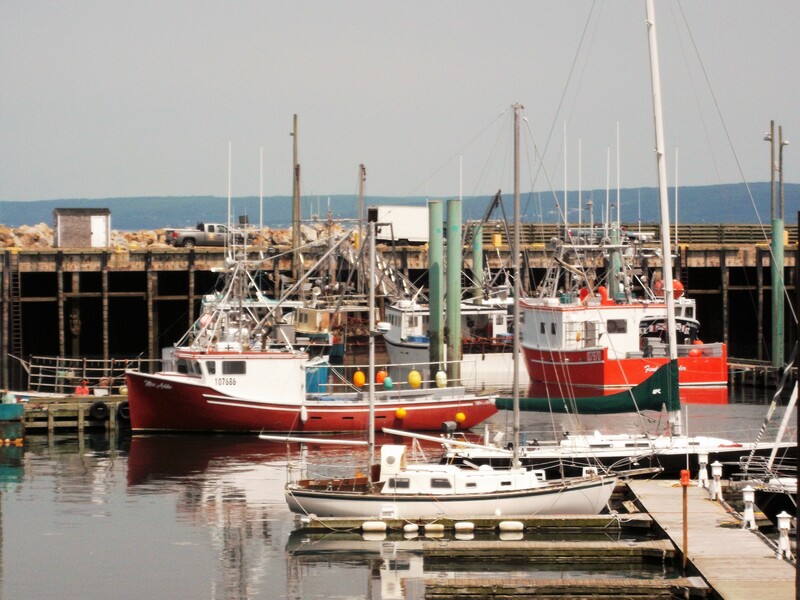 Digby Nova Scotia is a famous fishing village. It is renowned for its abundant catches of deep water scallops. 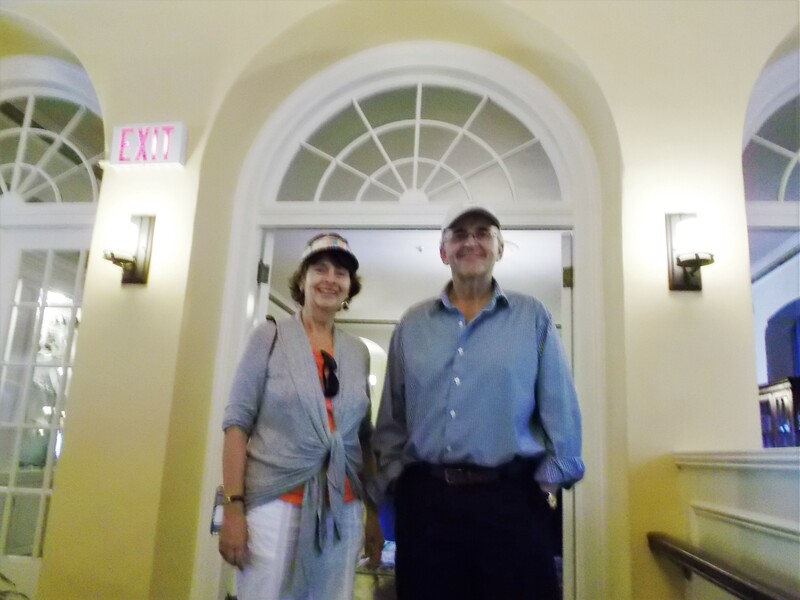 I posed with cousin Greg in the entrance to the dining room of the famous Digby Pines Resort, which has a lengthy history and a constant stream of guests! Resort, where Aunt Vivian once worked in the early 1940’s. Evangeline Beach at Grand Pre is a great place to hang out – whether the tide is in or out. Cape Blomidon is in the background. The fog does cool things off on a hot day though! On another outing, Greg took Vivian and me around the world-renowned Grand Pré area near Wolfville, which is a UNESCO World Heritage Centre. 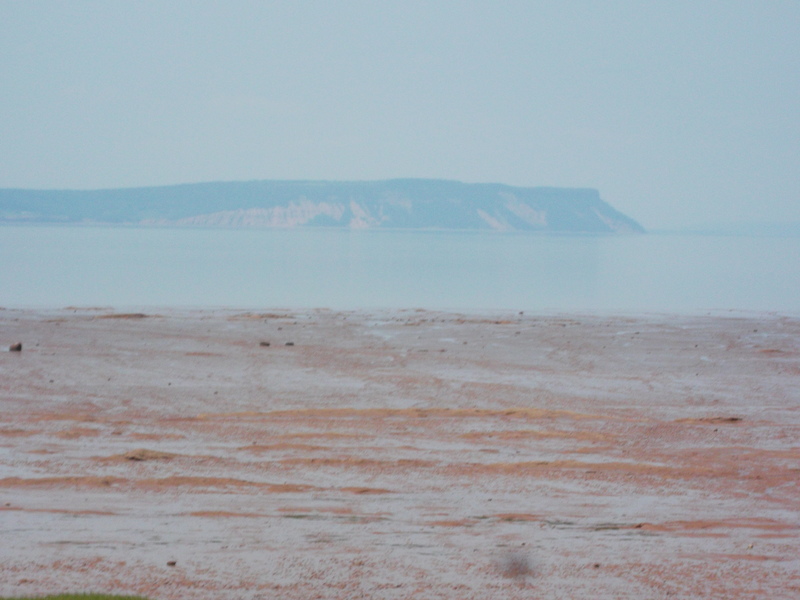 The dykes, which hold back the strong tides which prevail in the nearby New Minas Basin were first constructed by the Acadians in the 17th century and continue to protect valuable farmland to this day. Some of my Nova Scotia ‘roots’ originate in this area, so I always feel immediately at home when I visit this beautiful locale. 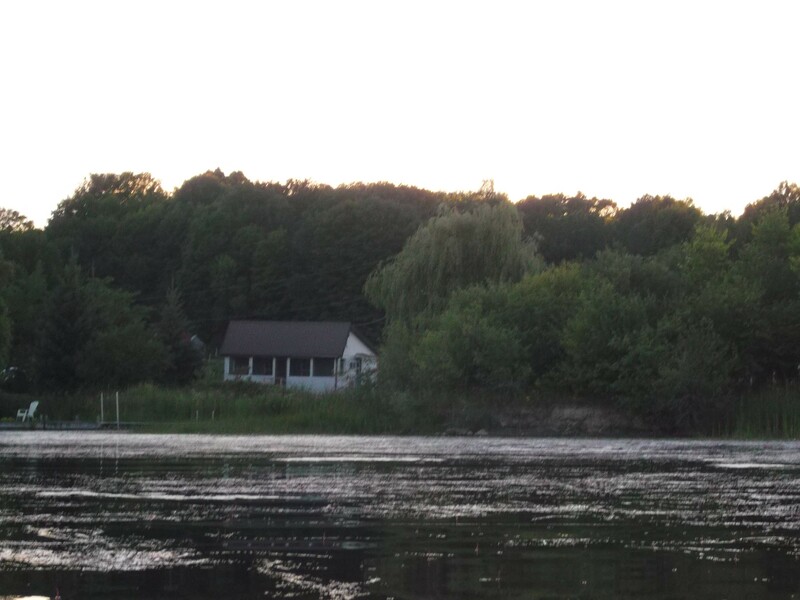 On some other occasions, I felt completely awed by the extent of my connections to the central Annapolis Valley. I really enjoyed the get-togethers, where I got to see and speak to several generations of my extended family – all the way to cousins three times removed. I can imagine Aunt Vivian’s tremendous delight at being able to enjoy and experience the accomplishments and experiences of her children, grand children and great-grandchildren. I am so happy for her! My week with the relations was short, but definitely sweet. I parted with assurances that I would return as soon as possible, although likely in the fall when the crops are in and exposures to pesticides would be greatly reduced. Autumn in Nova Scotia is generally gorgeous, with colourful leaves and bountiful harvests. 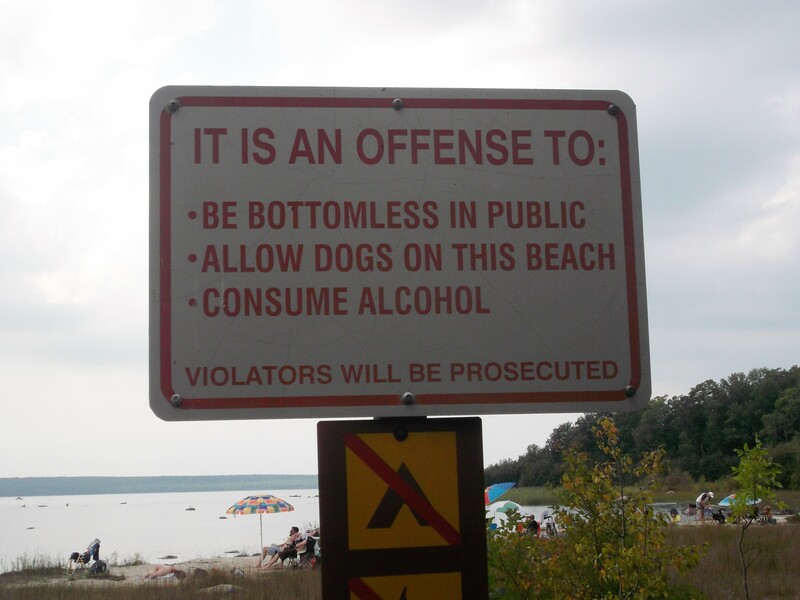 Sounds like a plan! 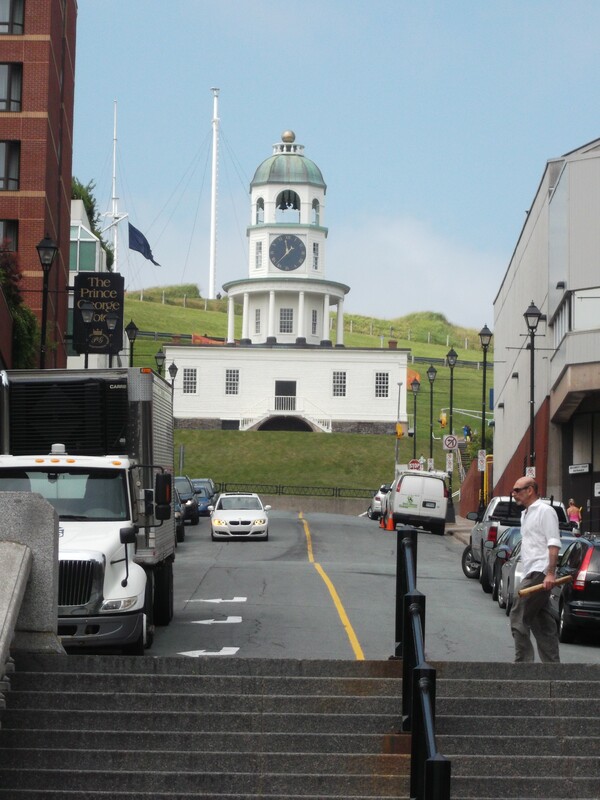 From downtown Halifax, the Town Clock on historic Citadel Hill is a prominent landmark. 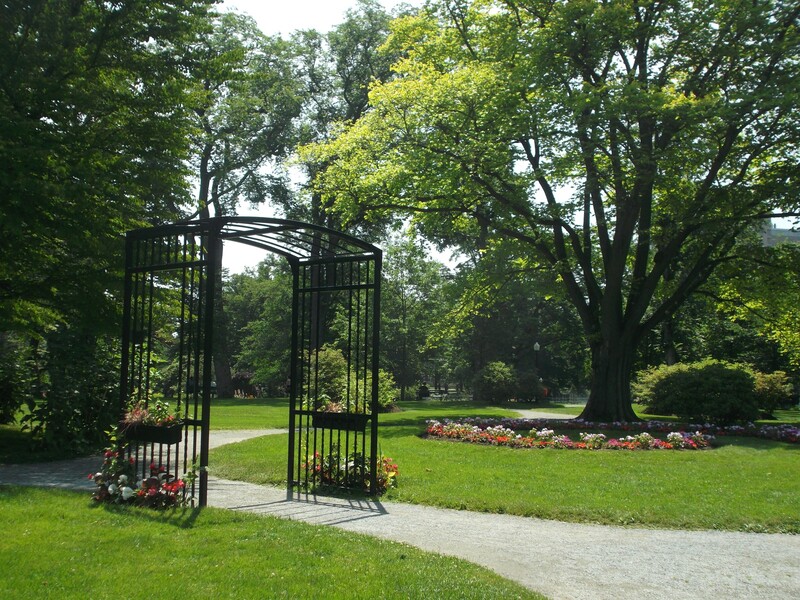 I love ‘the vibe’ in the Halifax Public Gardens. And I know I am not the only one. Everyone can find a spot to enjoy some solitude and natural beauty. a long time ago! It’s such a lovely and lively east coast port, which brings forth wonderful memories of my time well spent there – learning, living and working. Despite the fact that I became very ill there,I consider this vibrant city as the place where I ‘grew up’ after graduate school and pursued a career as a government librarian and .seriously developed my leisure pursuits as a singer. 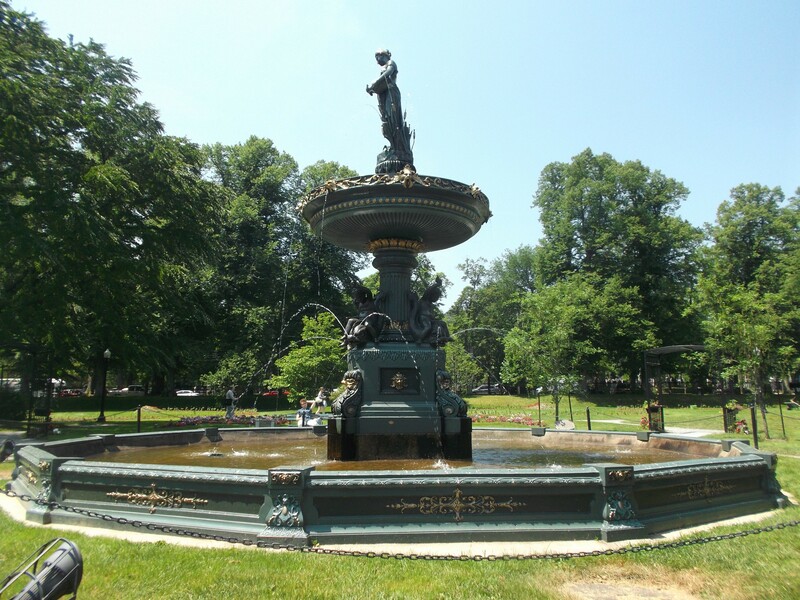 This fountain in the Halifax Public Gardens is a popular setting to sit nearby and enjoy the scene! 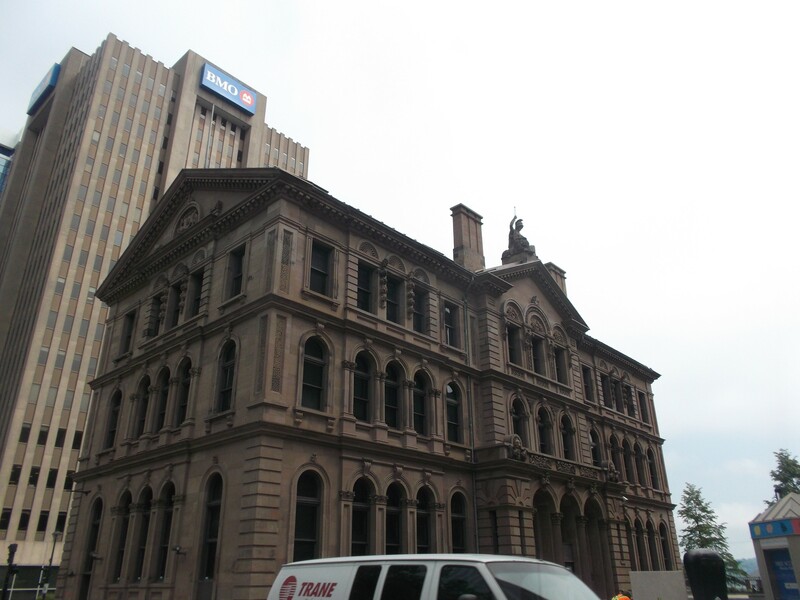 Downtown Halifax is a mix of old and new that complement each other very well. 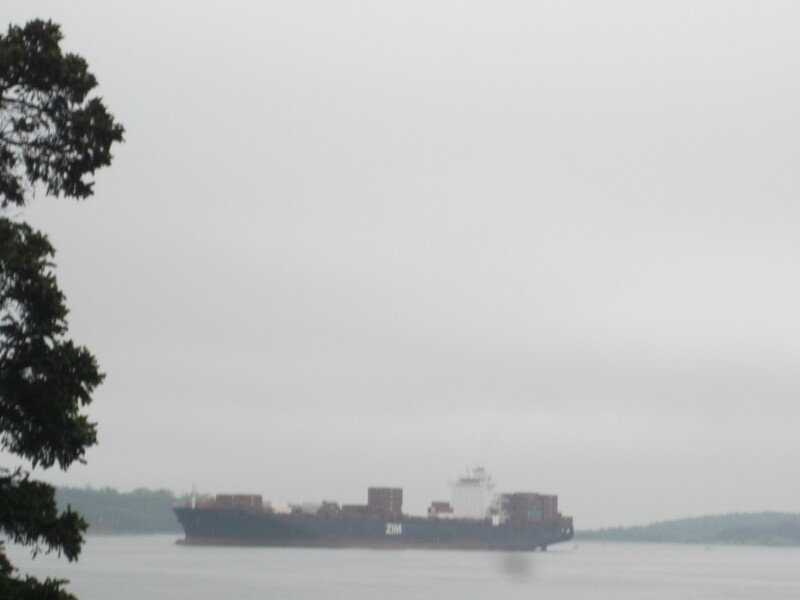 As the fog lifts, a container ship enters Halifax Harbour, as seen from Point Pleasant Park. The waterfront of Point Pleasant Park is rugged and brisk, as it faces the open Atlantic Ocean. 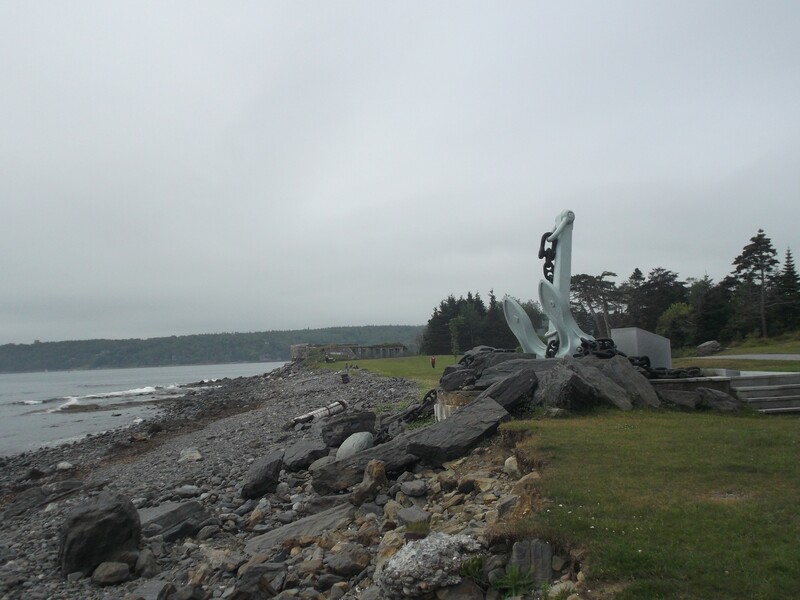 This anchor is a monument that pays tribute to men and women in the Canadian Navy who died in peaceful times. Halifax is and always has been an active sea port. 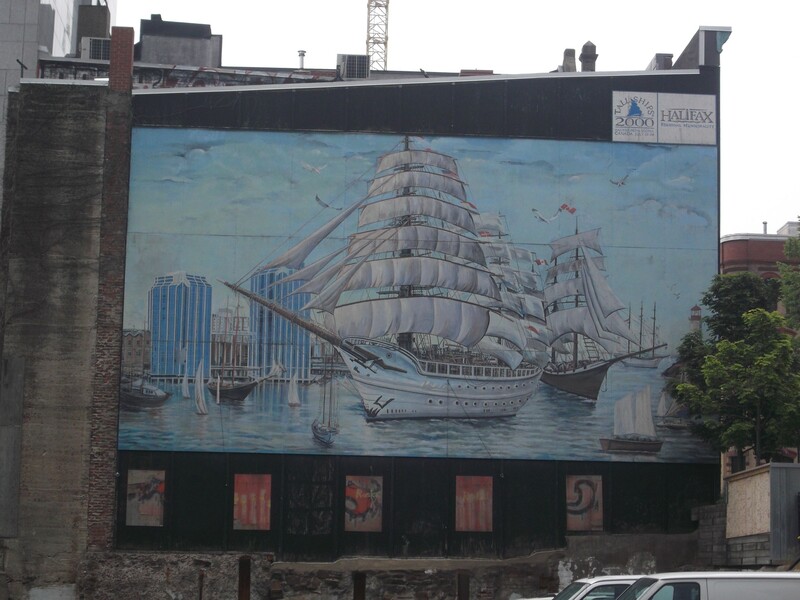 This mural depicts the tall ships that once anchored in the harbour. Sailing replicas are honoured every so often in festivals. friend from my days at Dalhousie University’s now-named School of Information Management. It’s always a treat to catch up on news as the years fly by. As I headed back to airport to begin my retreat in the wilderness north of Kingston Ontario, I acknowledged that a longer return visit to Halifax and the Annapolis Valley will be a priority on my next trip down east! 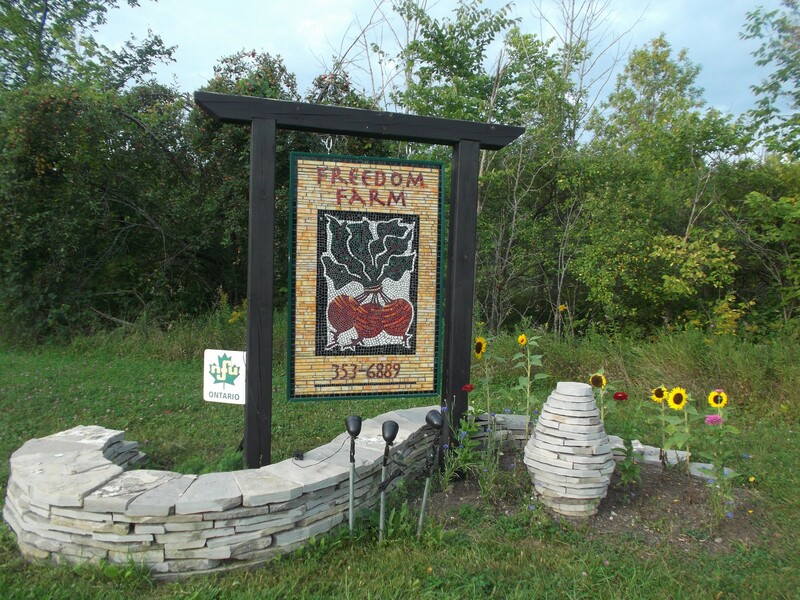 The Freedom Farm is situated near the Three Little Cottages, and the home of proprietors Sharon and Will Freeman. Freeman of Battersea, Ontario. 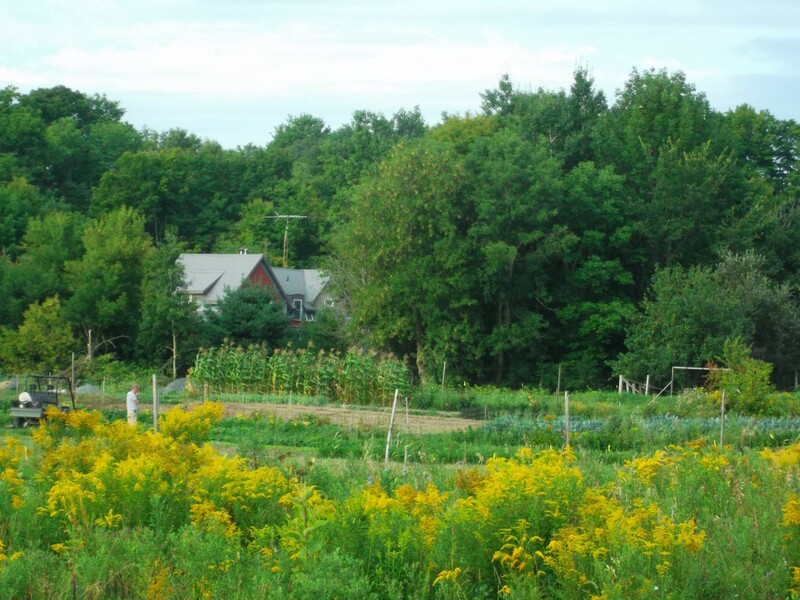 Their organic Freedom Farm, which is situated in close proximity to the cottages is the perfect complement to my Canadian quest for clean air, food and water! While these dedicated farmers quietly toiled over about 30 varieties of produce for their clients of the Community Supported Agriculture program, I was able to observe the tending and growing process and occasionally devour the ‘fruits’ of their labours – with great pleasure! 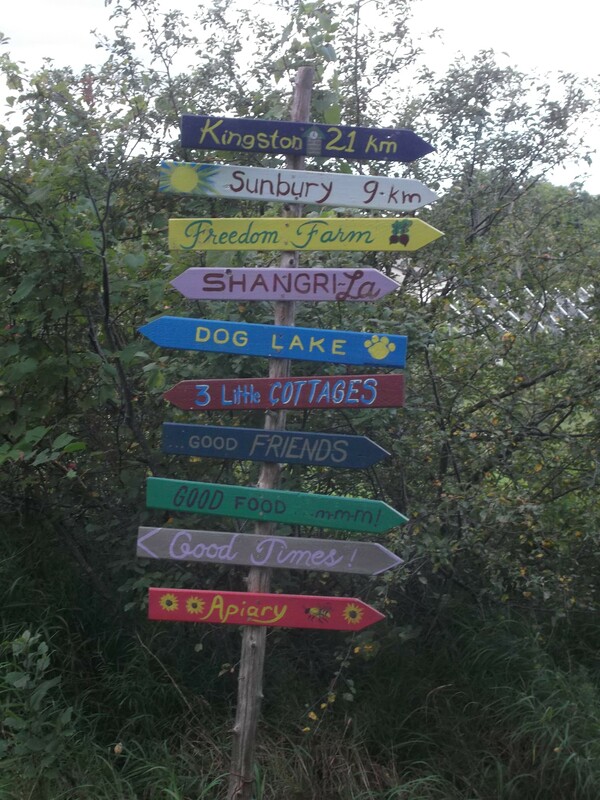 There are lots of good reasons to spend time at the Three Little Cottages and Freedom Farm – I should know! Its somewhat remote location actually forms part of the Frontenac Arch Biosphere (FAB), which is a UNESCO Biosphere Reserve. One of the biggest thrills for me in this place of serenity and solitude was the abundance of opportunities to observe wildlife up close. It was very exciting to be able to ‘shoot’ animals without ever disturbing them in their natural habitat. For me, that was a new experience that I want to repeat! A sampling of my encounters with wild four-legged and two-winged creatures is found below. 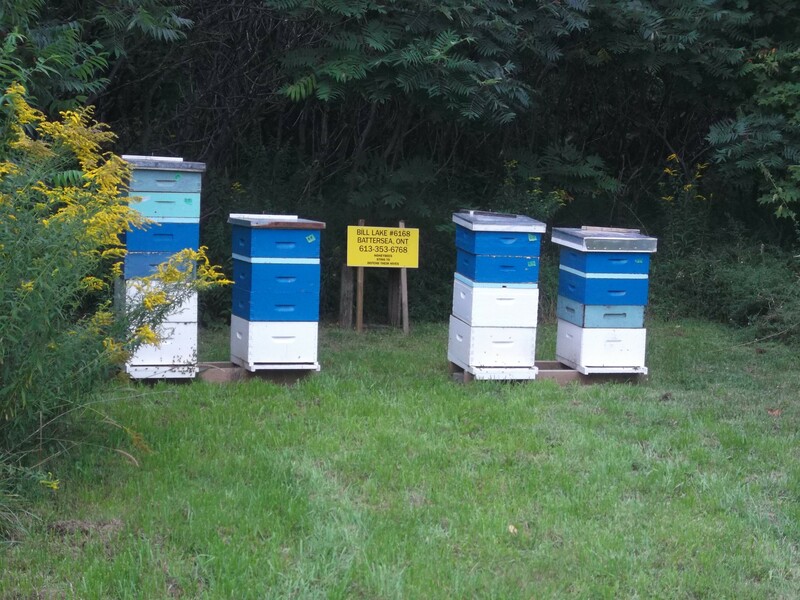 Bees happily buzzed around these hives on the Freedom Farm. They certainly had fields of plenty in order to make great honey! 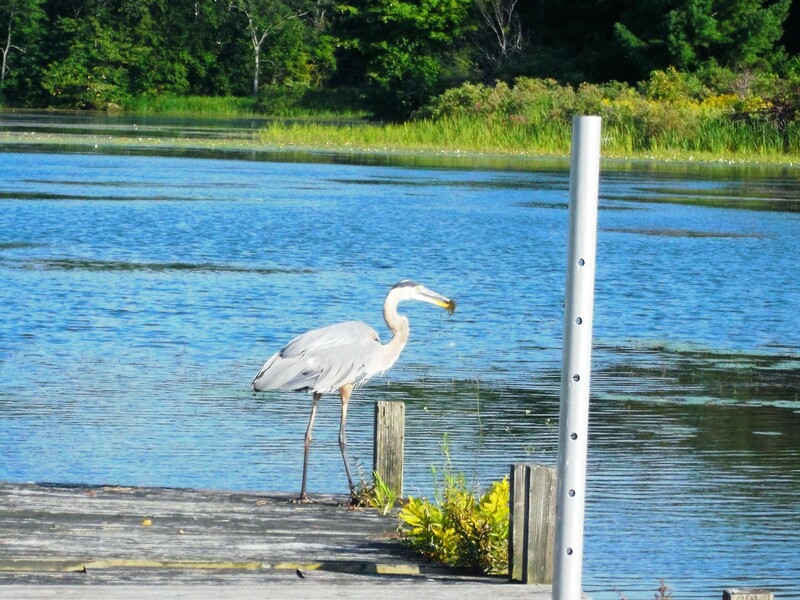 I nick-named this Great Blue Heron, ‘Herman’ because he seemed to want to get to know me. He certainly left his calling card – on my car and the roof of the cottage! Cute little bunnies hopped about the fields and lane ways – but they were not encouraged to hang around the garden, of course! 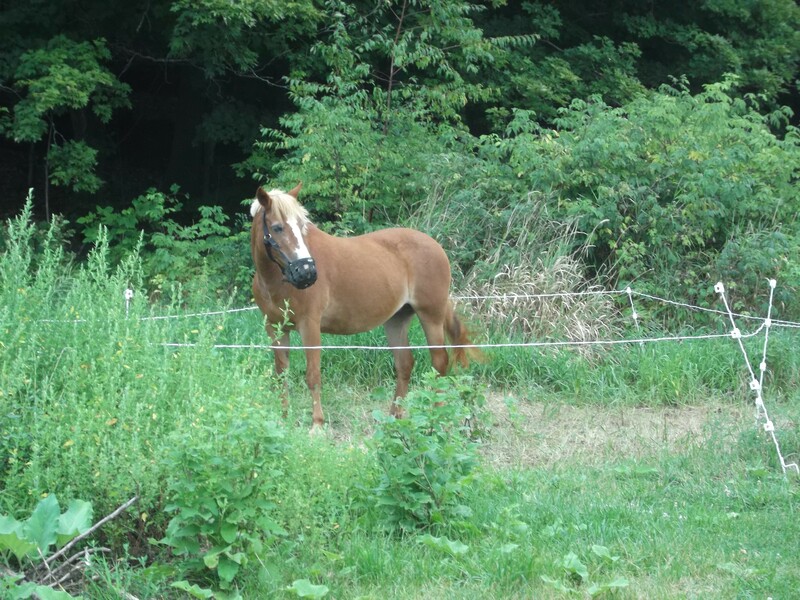 Some domestic animals occupied the Freedom Farm – ponies, dogs and a cat added to the homey feel of the place. 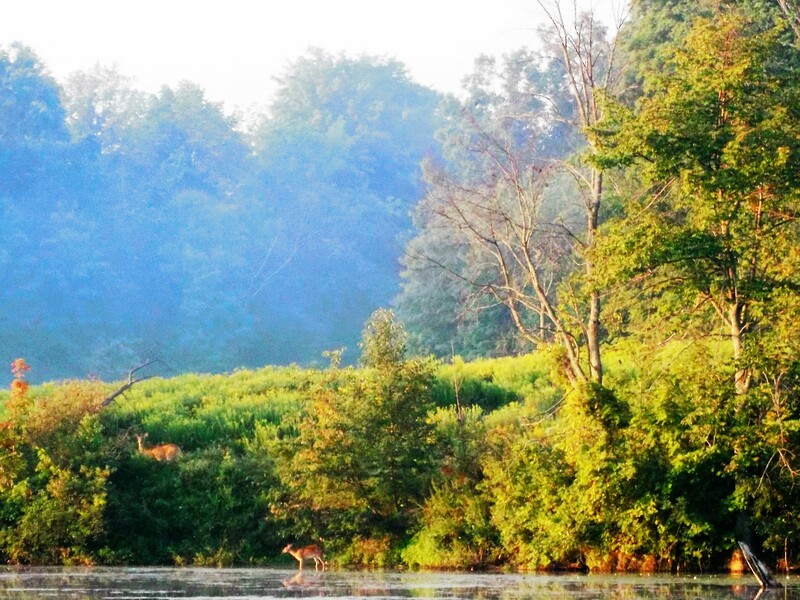 At daybreak, , a family of deer would sometimes come to the shore directly opposite the dock of the cottage for a drink. 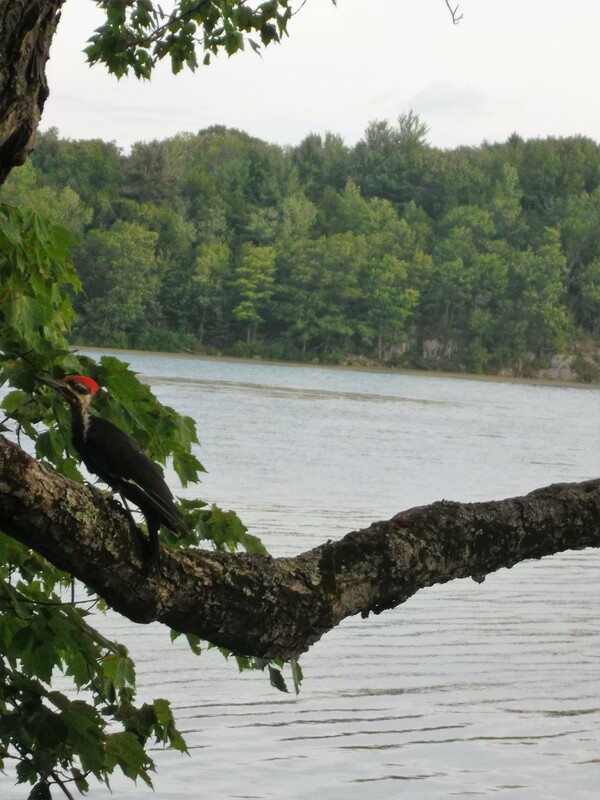 I caught this Pileated Woodpecker early one morning at Gilmour Point on Dog Lake near Battersea Ontario. It’s also an area renowned for fishing, and my brother and sister-in-law took advantage of that opportunity. Edwin did catch a ‘big one’, but that is a story for another day. I had fun watching them cast their lines – morning, noon and night! 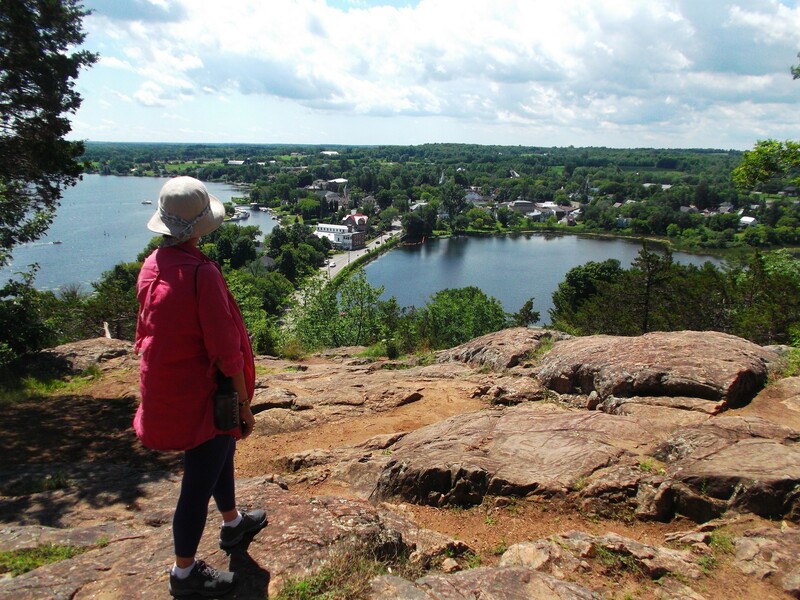 It’s fun to look over the pretty village of Westport on Upper Rideau Lake from Spy Rock in the Foley Mountain Conservation Area. Photo taken by Edwin. 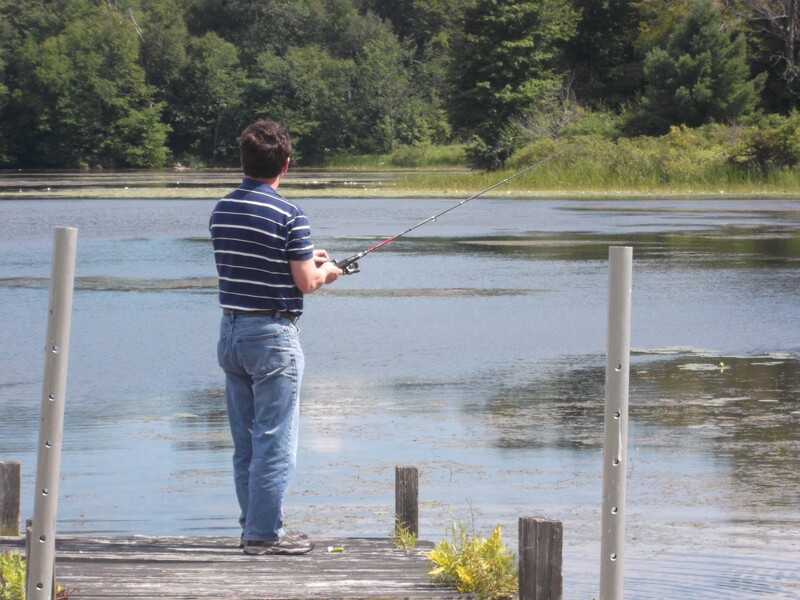 There’s always another ‘big one’ out there, and the many fishing enthusiasts on Dog Lake will tell you so! 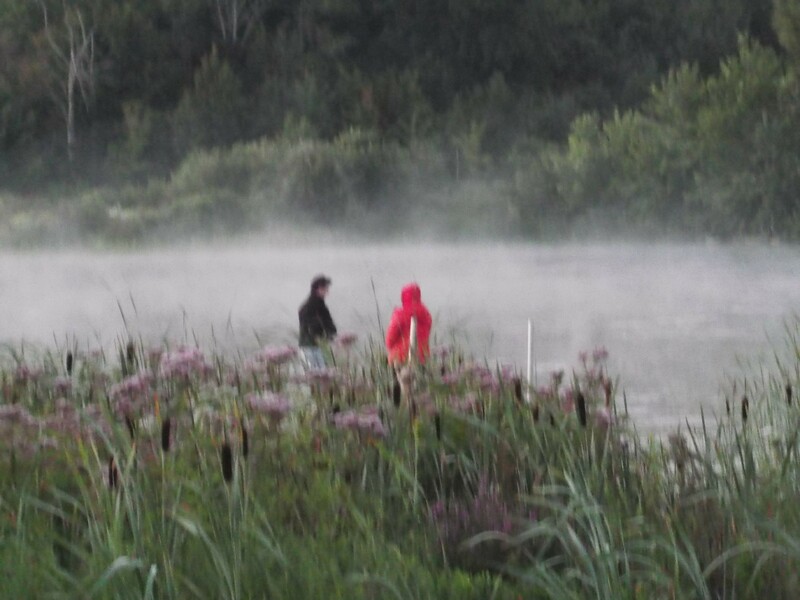 I caught Edwin and Beth casting their lines at the crack of dawn – ever hopeful for one that didn’t get away! drove half an hour south of the cottage near Battersea to go ‘downtown’, as my family used to refer to outings to Kingston from our country location. 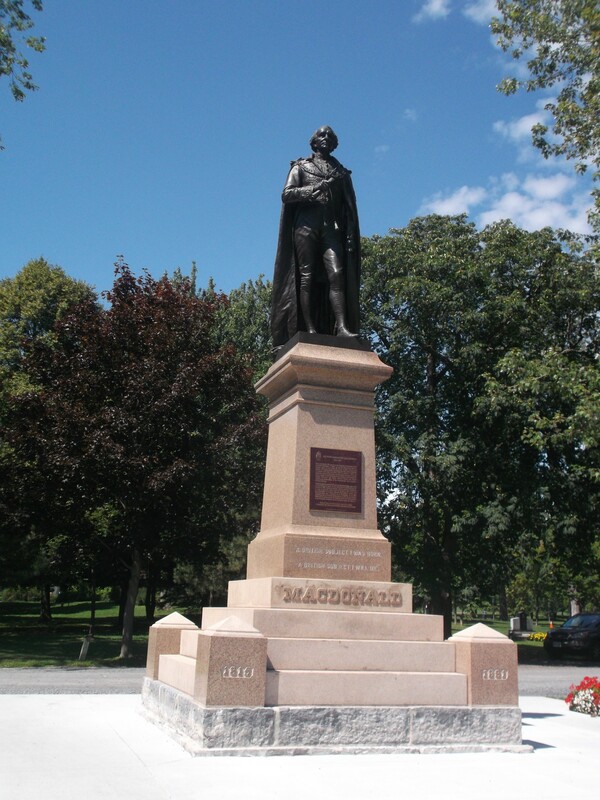 This regal statue of Sir John A. Macdonald figures prominently in Kingston’s City Park! 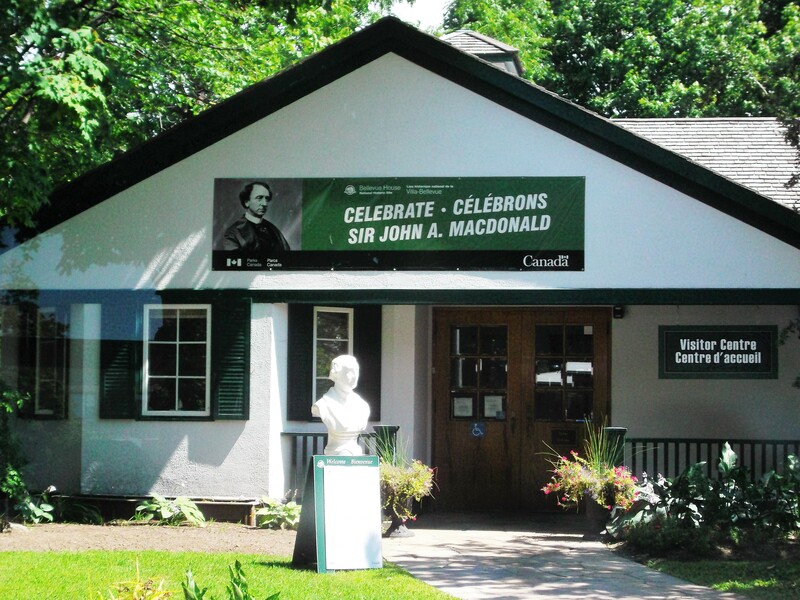 interest in a local refresher was prompted by the celebration of the 200th anniversary (bicentennial) of the birth of Sir John A. Macdonald, Canada’s first prime minister. Although he was not actually born here, he resided in Kingston, Canada’s first capital, for most of his life He subsequently died in Ottawa, the current longstanding federal capital. This visionary man was instrumental in developing a national railroad (from coast to coast) and, as a Father of Confederation, recognized that the country’s early cultural and regional differences would ideally make an exceptional nation! He met with many pitfalls along the way (both personally and professionally), but he perservered, and his ideas greatly influenced the kind of country that Canada is today! There are a number of buildings around Kingston that were once occupied by Sir John A. for personal or business interests. This pub was his law office. It’s located on King Street East and offers good food at reasonable prices! caught up quickly on what was long forgotten in terms of my knowledge of this great Canadian when I took in the Salon Theatre Company’s top-notch re-enactment of the key events during Macdonald’s life in Kingston in an outdoor setting. If you are in Kingston Ontario in the summer months, you’ve got to check out the Salon Theatre Company’s super show on Sir John A.! 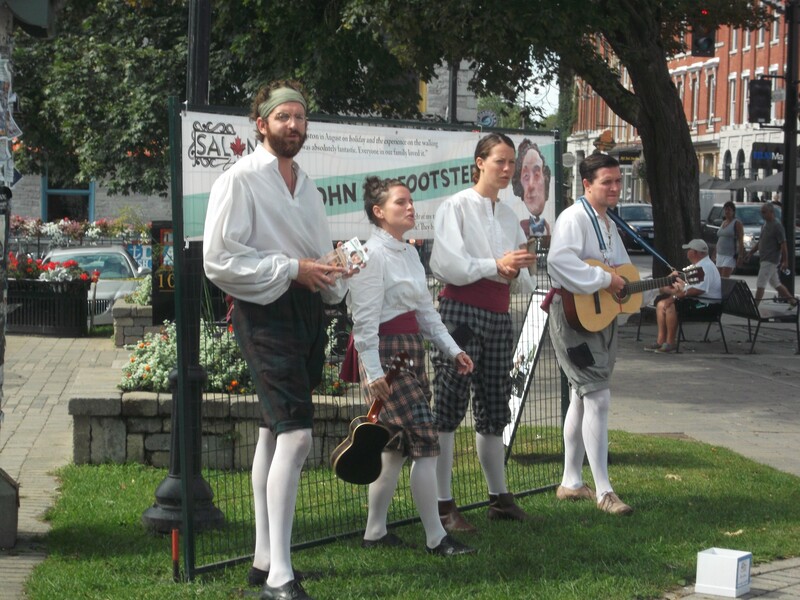 The Salon Theatre Company offered a highly entertaining and instructional production called ‘In Sir John A.’s Footsteps’ in downtown Kingston. 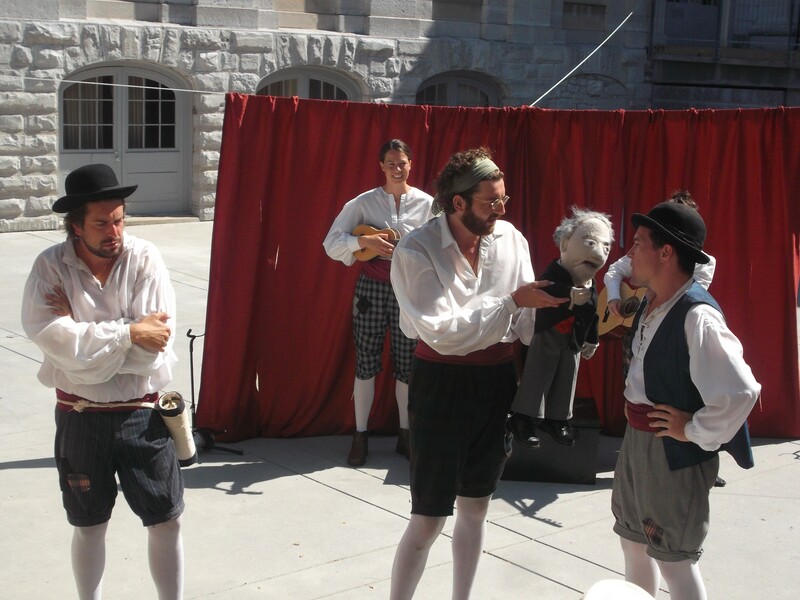 I thoroughly enjoyed the one hour performance by this professional acting troupe, and I could easily understand why they were rated a Trip Advisor top attraction in Kingston this past summer! Bellevue House in Kingston is a fascinating museum that displays effects from the time when Sir John A. and his family lived there in the mid 19th century. 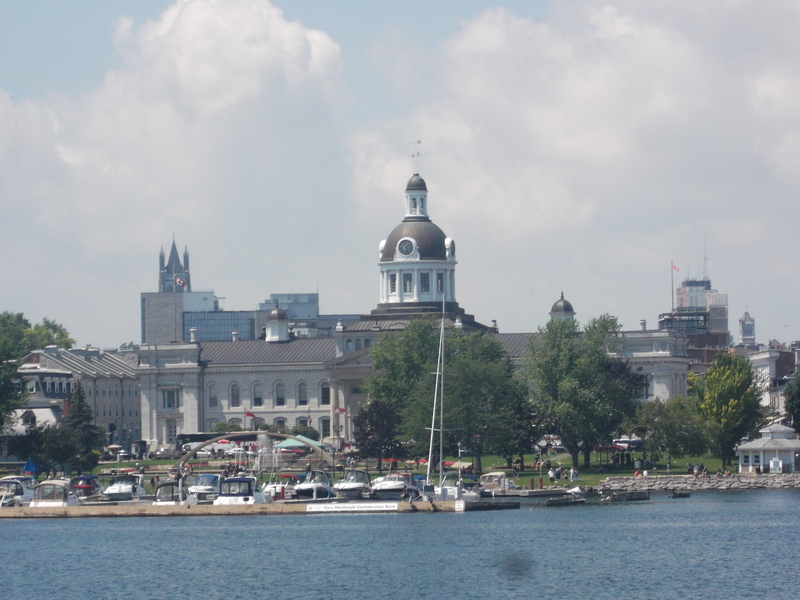 of the Limestone City, as Kingston played such a prominent role in the founding of the Dominion of Canada. The historic sites are all very significant and well worth the review. As well, I heard more about our first prime minister. 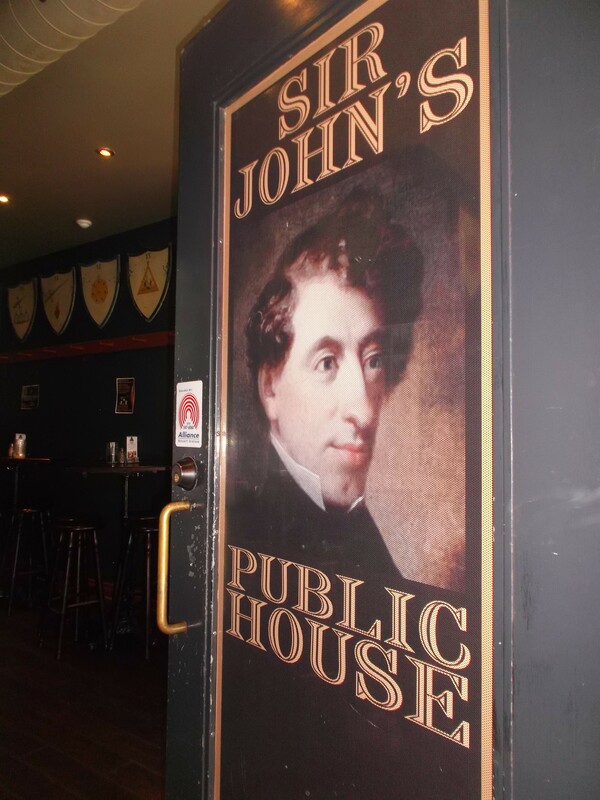 Kingstonians are certainly proud of their Sir John A.! The dome of Kingston City Hall (centre) and the spire of St. Mary’s Cathedral (left)figure prominently as one approaches from Lake Ontario. 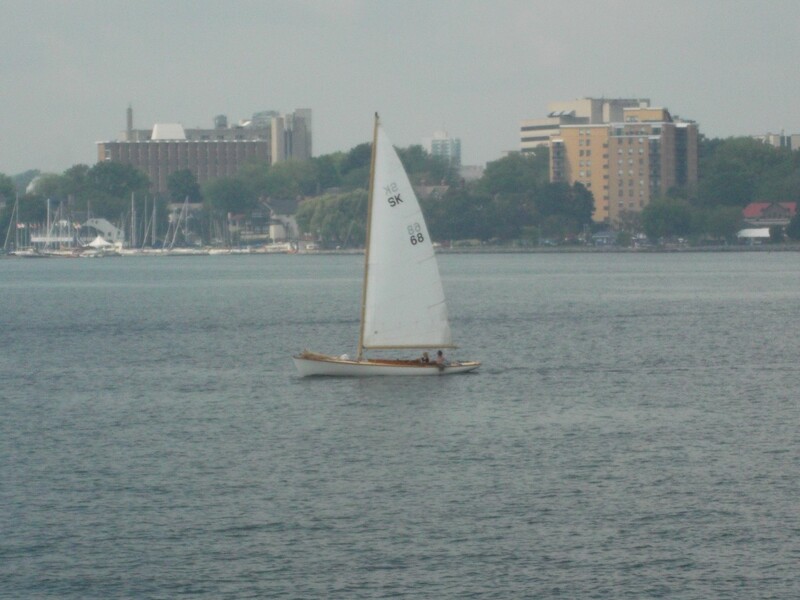 Kingston is renowned for its excellent sailing conditions. It hosted the sailing competitions during the Montreal Olympics in 1976.
important location at the intersection of Lake Ontario, the St. Lawrence River and the Rideau Canal! Certainly the afternoon’s journey was most revitalizing. However, I did not take time to visit the quaint town of Marysville on the island, but will certainly do that on my next trip to Kingston. 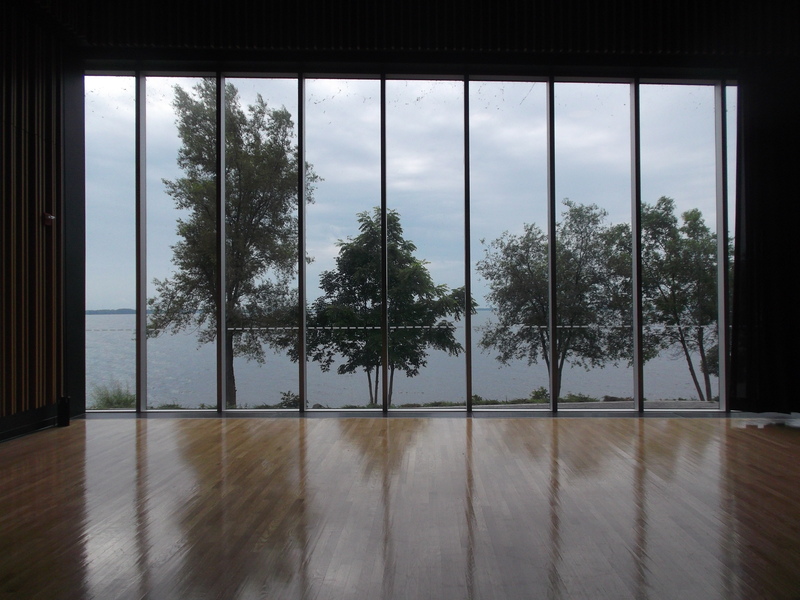 The rehearsal studio at ‘The Isabel’ overlooks Lake Ontario. 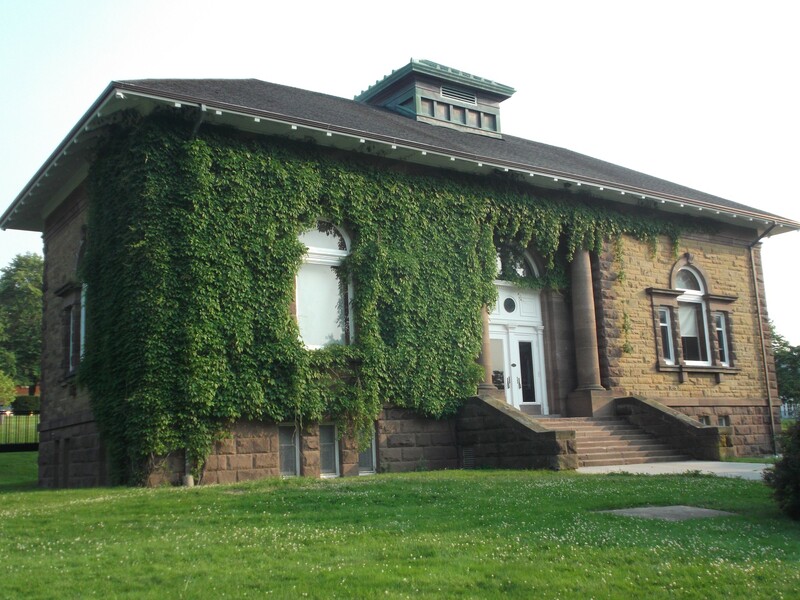 What a spectacular setting for musical and theatrical endeavors! 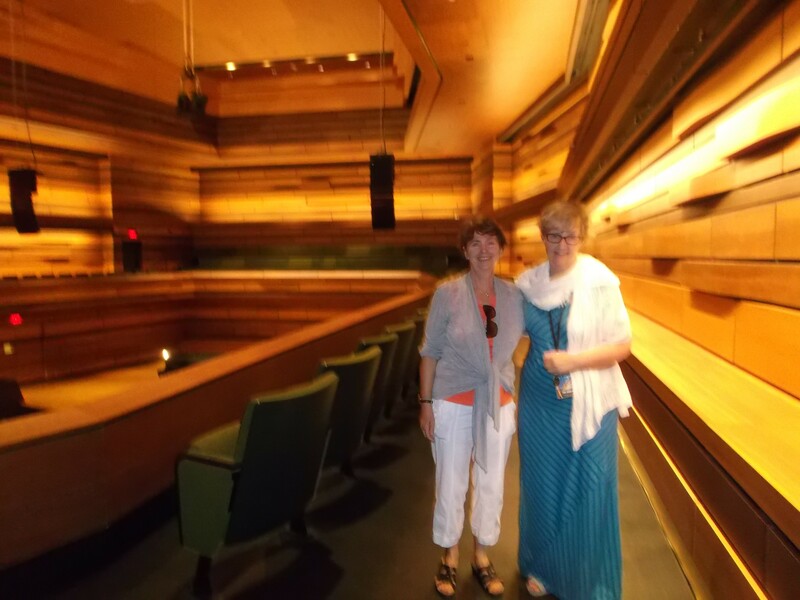 I was very honoured to be taken on a tour of the Isabel Bader Centre for the Performing Arts by its Director, Ms. Tricia Baldwin. I am very grateful to Ms. Faye Ransom, Senior Development Officer/Gift Planning at Queen’s University for organizing this delightful visit. Photo taken by Faye. Bader Centre for the Performing Arts at Queen’s University. As a graduate of the School of Music, I truly admired the state-of-the-art performance hall and attractive rehearsal space, both with world-class acoustics. I was bold enough to sing a few notes from the stage and was completely amazed by the quality of the sound. I envied current students, who I am sure will make good use of this facility. I hope they will enjoy it as much as I would! In fact, the entire summer seemed to be filled with joyous events and occasions. 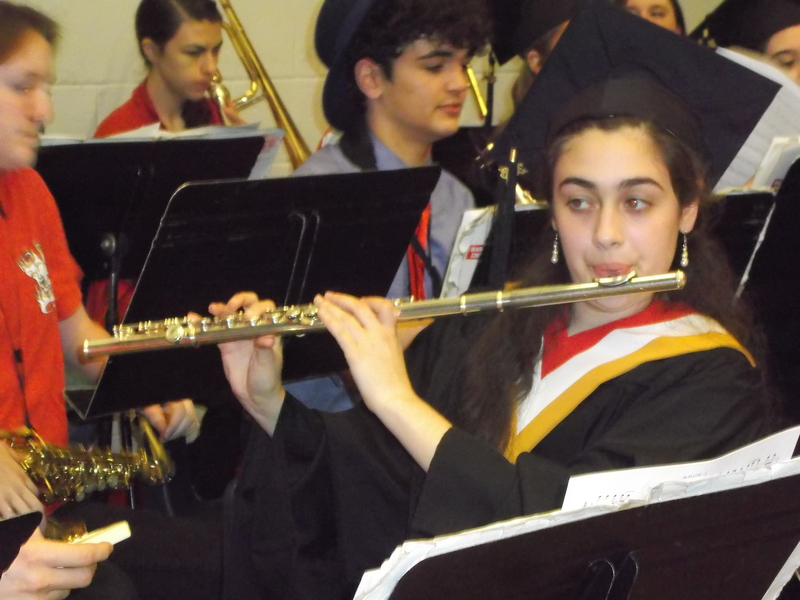 Before the formal grad ceremony commenced, Mara played flute with her high school band. Behind her on alto saxophone is her brother Dallin (in the hat). They are both accomplished young musicians! 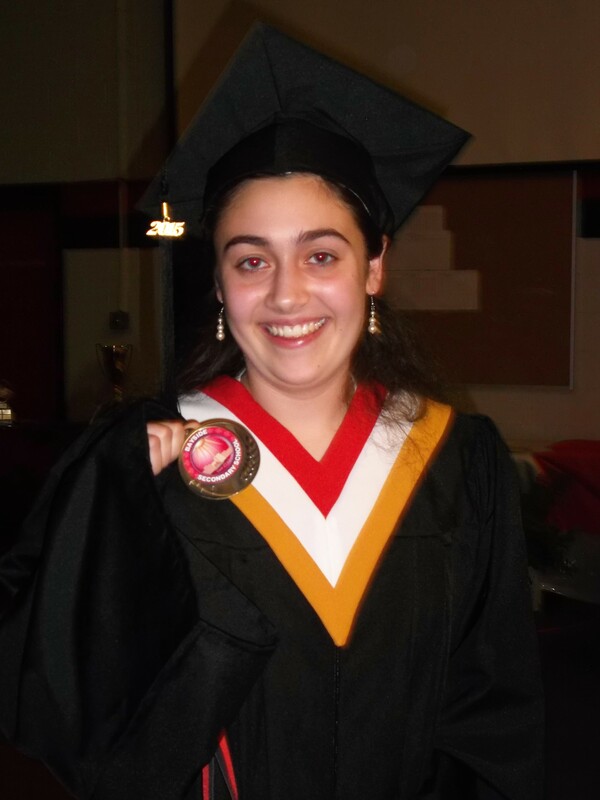 My niece Mara was all smiles when she received the Governor General’s Medal at her high school graduation for the highest academic average at her high school . It was an honour as a proud Auntie to attend the high school graduation of my niece Mara, whose incredible academic accomplishments earned her the prestigious Governor General’s Medal, among other awards and post-secondary scholarships. She is a very humble, hardworking young lady, and I wish her much success in her university studies (at Queen’s!) and beyond. 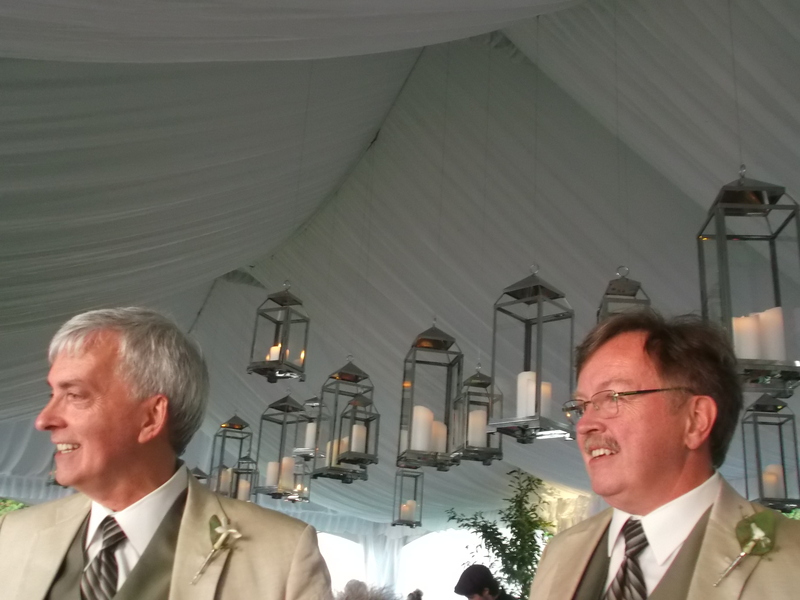 It was a beautiful day in early July when my longtime friends David and John formally ‘tied the knot’ in a moving ceremony before 100+ guests at their home in eastern Ontario. longtime friends David and John at their home in eastern Ontario. Throughout that special afternoon, I was enveloped in the complete sensation of love and honour that prevailed throughout this unforgettable day. I felt so proud to be one of the 100+ witnesses of their formal vows of commitment to each other. The feelings of good will were definitely infectious. I wish my dear friends happiness and love always. I cherish this photo of me with my brothers, Edwin (l) and Marc from our Summer 2015 reunion. 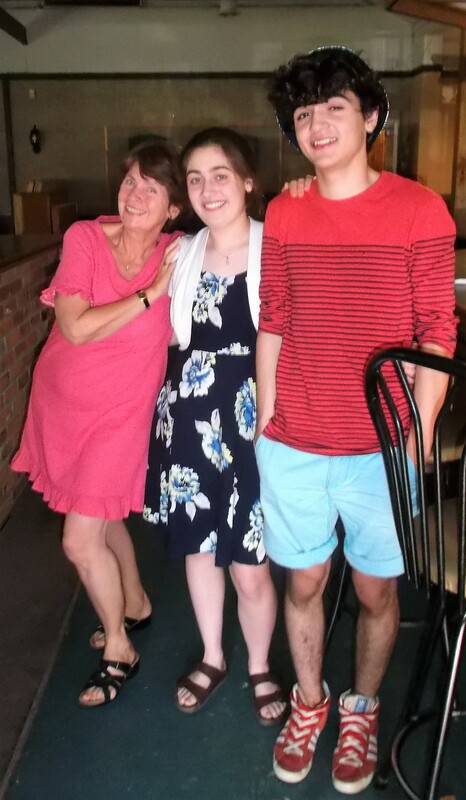 Auntie Gwen delighted in the chance to spend a little time with her niece Mara and her nephew Dallin in the Summer of 2015.
has participated in a number of plays produced by the Stirling Festival Theatre‘s Young Company in Stirling, Ontario. This year, I got to take in all the fun watching him and the cast singing and acting their hearts out in ‘Legally Blonde, The Musical’. 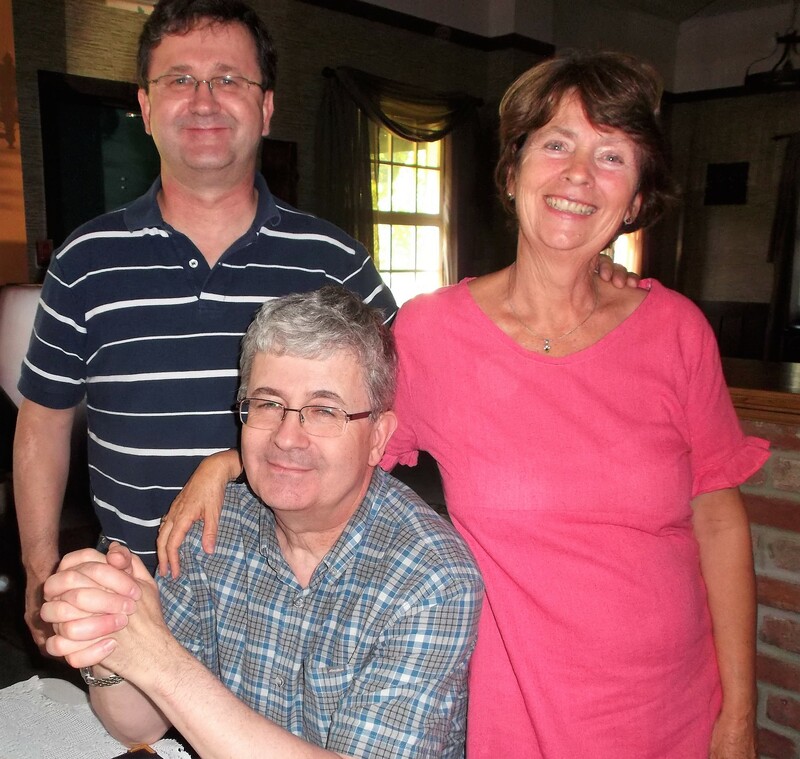 After I saw the hilarious show for the second time, we gathered for a family reunion at The Black Dog Family Restaurant in Stirling, to top off the happy events of the Summer of 2015. We were all in fine form, and I have the photos to prove it! After our gathering I drove back to the little cottage north of Kingston to spend what I thought would be my final week in Canada. As we now know, Tropical Storm Erika changed my plans and I got to enjoy a longer visit with family and friends. But before that happened, I felt completely at peace with my commune with nature and the pervasive tranquility that enveloped me during my six week retreat at the Three Little Cottages. I hope it won’t be too many summers before I can return there again! But wait… there’s more! I haven’t told you about the adventures in Nova Scotia with my relatives this past July! Find out about my down-east fun times in the next post! At summer’s end, even the fishing fanatics on Dog Lake have gone ‘home’. 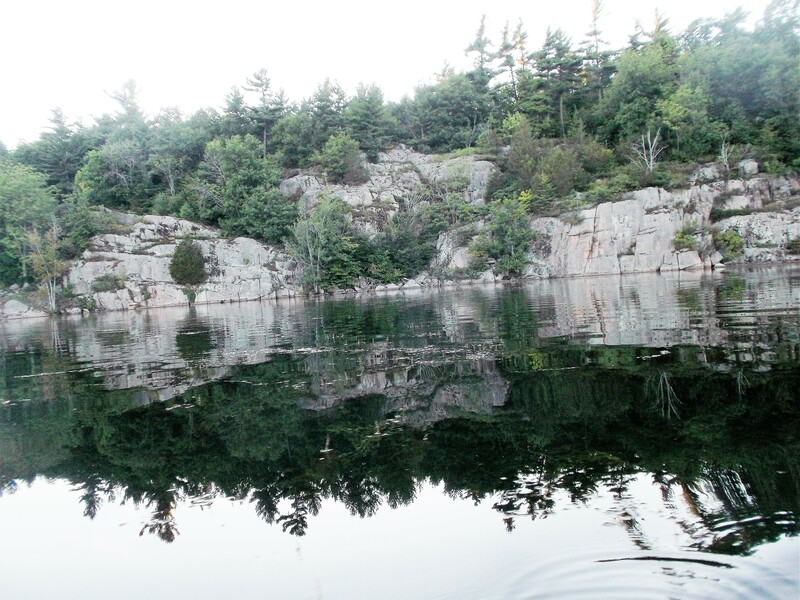 One can get up close and personal with the rocky granite shoreline of Dog Lake when in a canoe. 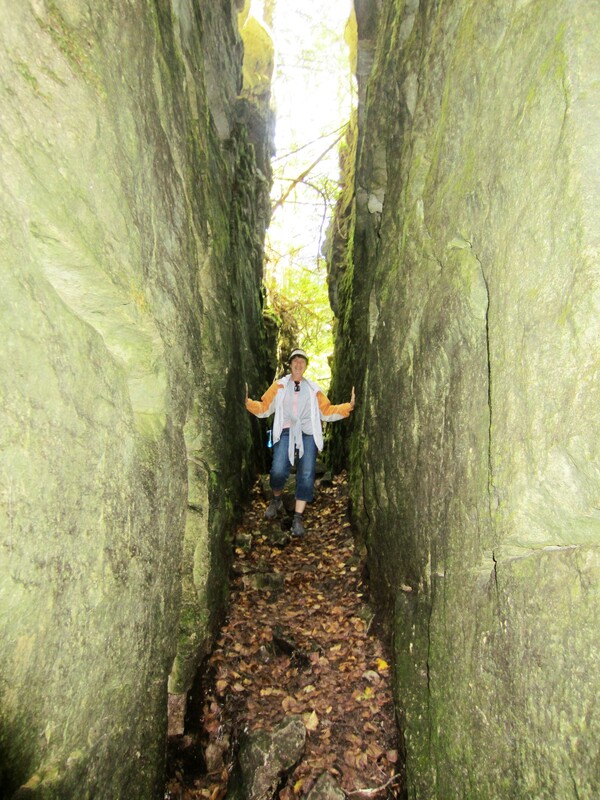 It’s part of the Frontenac Arch Biosphere (FAB). 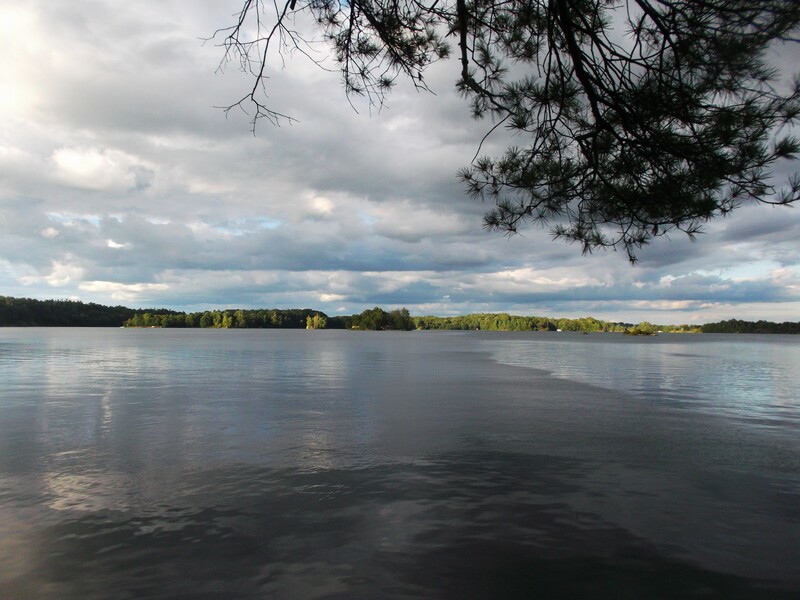 One Long Lovely Summer in Eastern Canada: Nature and Nurture Not Far From Toronto! 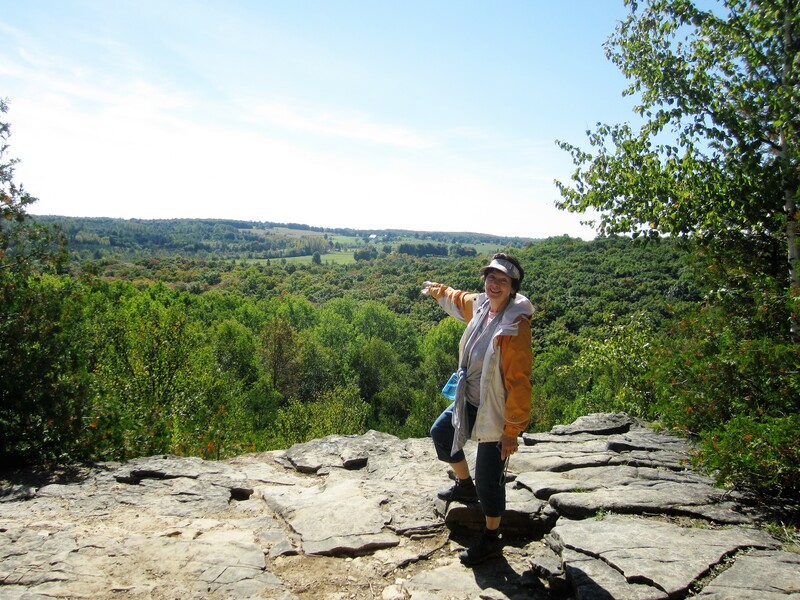 The 400 acre Nottawasaga Bluffs Conservation Area on the Niagara Escarpment is a mere half hour drive west of Barrie and is south of Collingwood. My extended visit to Canada (thanks to Tropical Storm Erika in Dominica) started and ended in a lovely city one hour north of Toronto, which is a relatively easy commute by car, bus or train from there to the big city. One of my brothers lives in Barrie, Ontario and I spent several weeks with him and his wife Beth, which included a number of outings to the surrounding countryside. I had no idea how beautiful the area is, until my brother Edwin showed me around! I could understand why Torontonians like to escape on weekends to this region, as it offers nature, culture and adventure of a slightly different kind than dear Dominica! 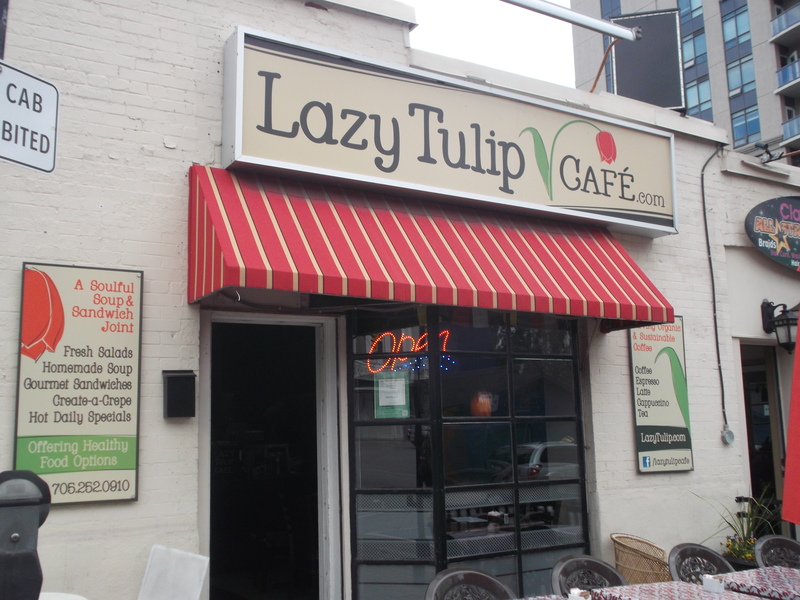 The Lazy Tulip Cafe is conveniently located near the Barrie Bus Terminal, at 29 Maple Avenue. 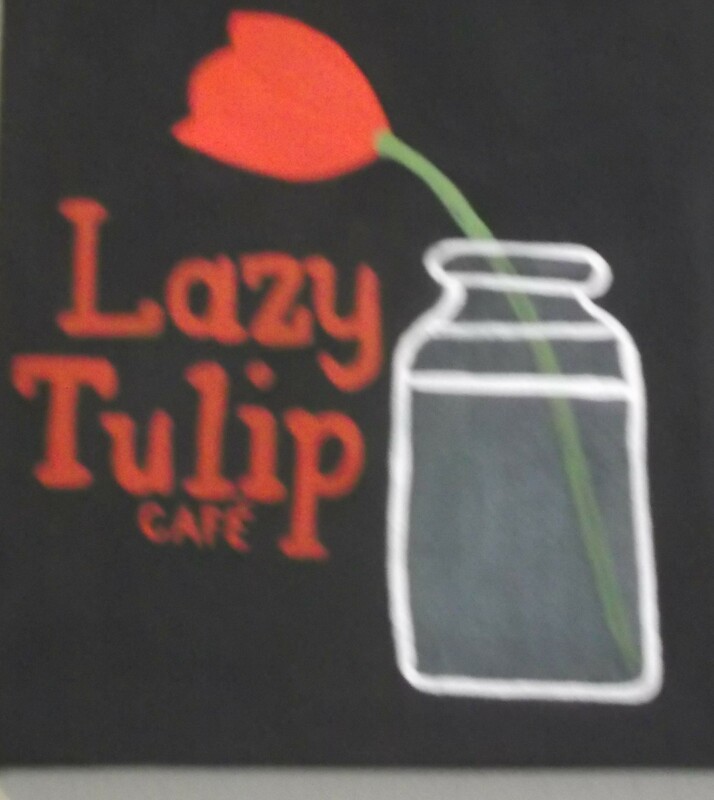 If you want to know why it’s called the Lazy Tulip Cafe, you just have to go there and ask Michelle, the owner! proprietor of the Lazy Tulip Café. I really enjoyed the homey ambience, convenient WiFi and casual conversations over my usual half-day stay. That’s where I wrote several of my Dominica-Erika blog posts! Michelle sincerely commiserated with me about the catastrophe on Dominica, as she has a property in the Bahamas, and understood the vulnerability of Caribbean islands to natural disasters. It is certainly a coincidence that we both profoundly felt the effects of life in the hurricane zone, even though we were both far away from it when the storms hit our respective adopted homes! On weekends, my brother took me to several wonderful places and I am very grateful to have had the opportunity to explore new territory in my home province! I think this is a Thomson, but you can correct me if I am wrong! I think this is A.J. 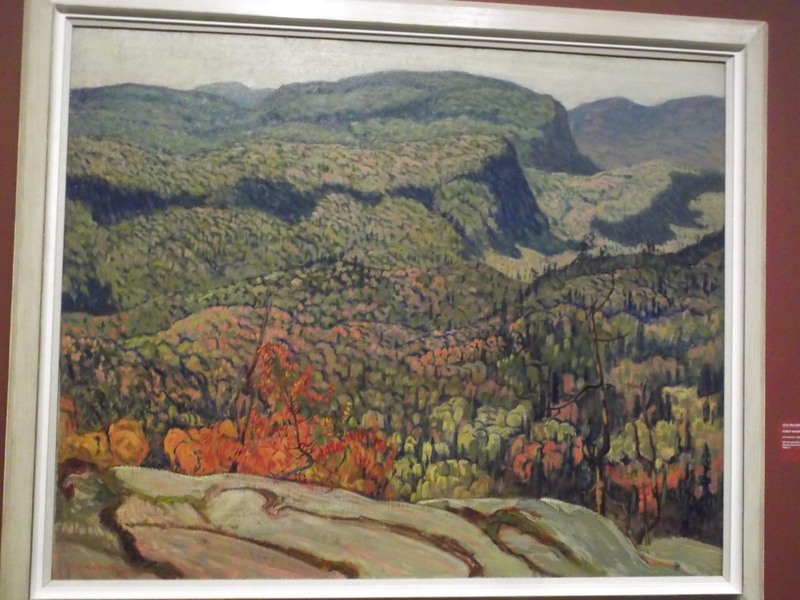 Casson of the Group of Seven . Please let me know if it belongs to one of the others in the Group of Seven! interested traveller to the McMichael Canadian Art Gallery at Kleinburg, Ontario. 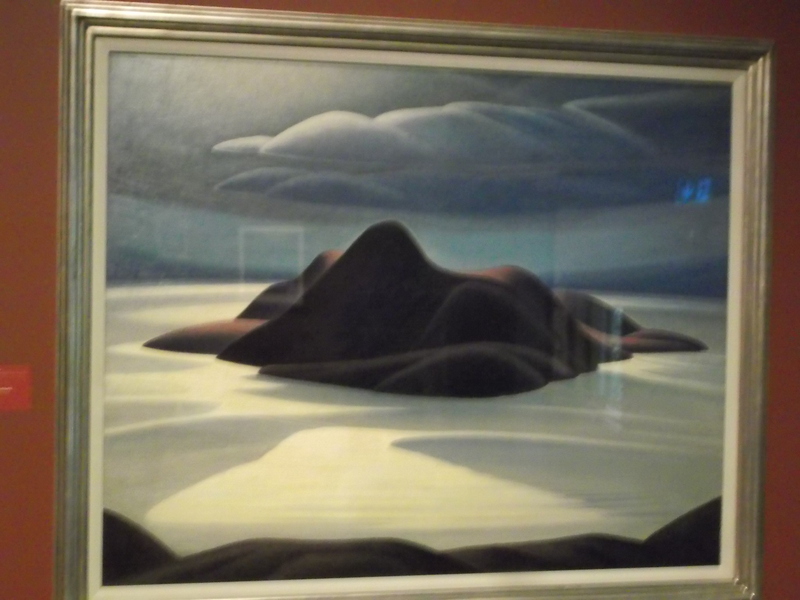 There, I took in for the first time, the incredible, renowned paintings of the famous ‘Group of Seven‘, along with Tom Thomson, First Nations and Inuit artists. If you want to have an overview contemporary of Canadian styles, then this is the place to go! I thoroughly enjoyed this gentle introduction back to my homeland. 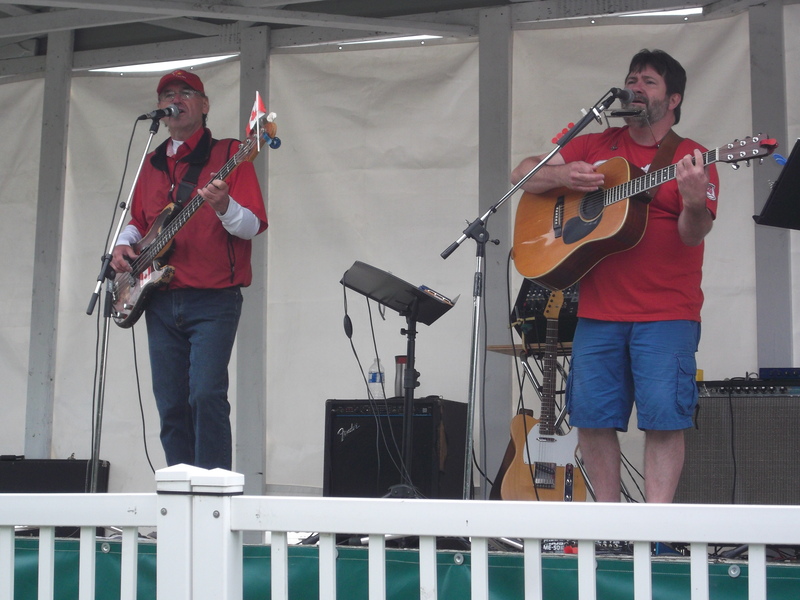 At the Binder Twine Festival, these musicians played some sweet down-home music. 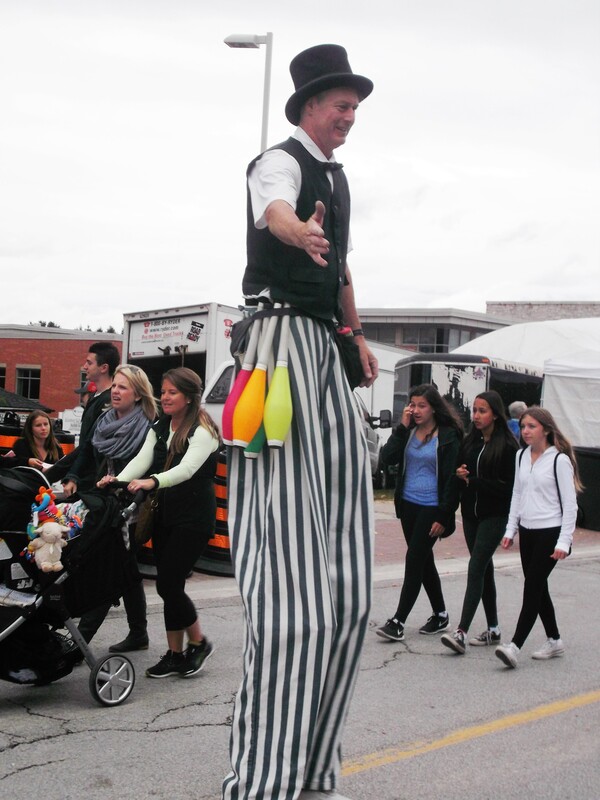 This stiltwalker got lots of attention, even when he wasn’t juggling at the Binder Twine Festival. draws a crowd from the big city. While we were disappointed not to see any large farm animals, I did enjoy looking at handmade quilts, and watching some local performers right on the street. 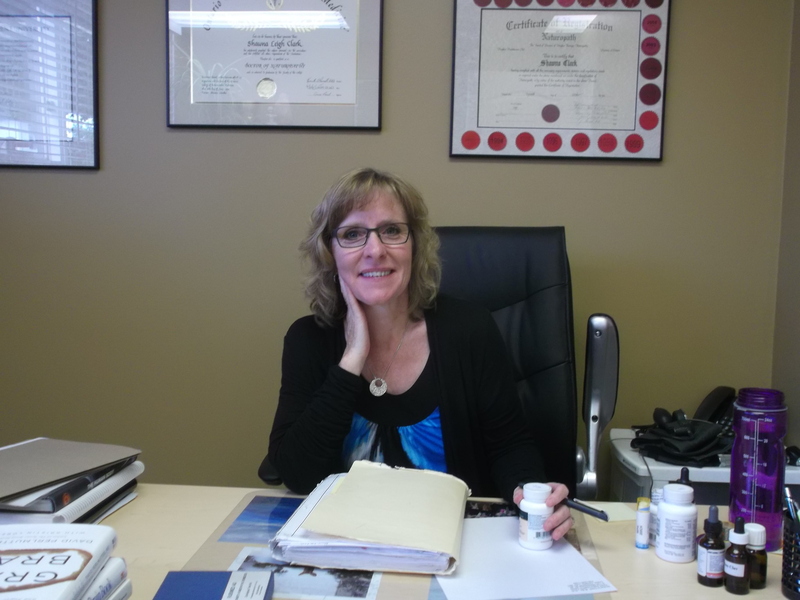 Dr. Shawna Clark, N.D. has been my naturopathic physician for over 18 years. She has helped me to have an improved quality of life and health. I don’t know what I would do without her guidance and treatment advice! 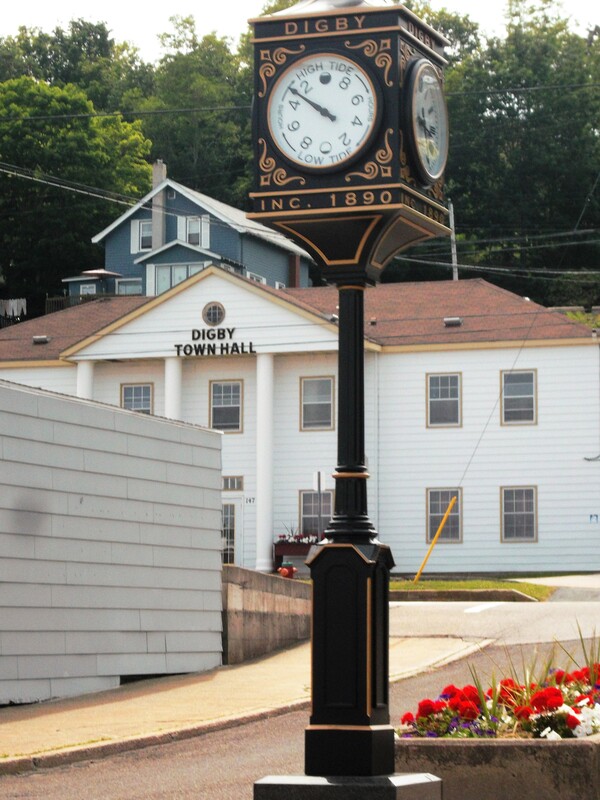 office is conveniently located in this pretty hamlet on the shores of Lake Simcoe. In fact, it was tremendously helpful for me to be able to see her in person three times over this long lovely summer. Her counselling and recommended nutritional support with supplements, along with homeopathic remedies enabled me to cope well with my persistent environmental health challenges. On Canada Day (July 1st), I convinced my brother to take the half hour drive ‘up the road’ to see the parade in Orillia. Last year, I had enjoyed the spectacle in the booming city of Halifax, my favourite east coast port. I was curious to see how a smaller central Canadian centre would celebrate our big national day. 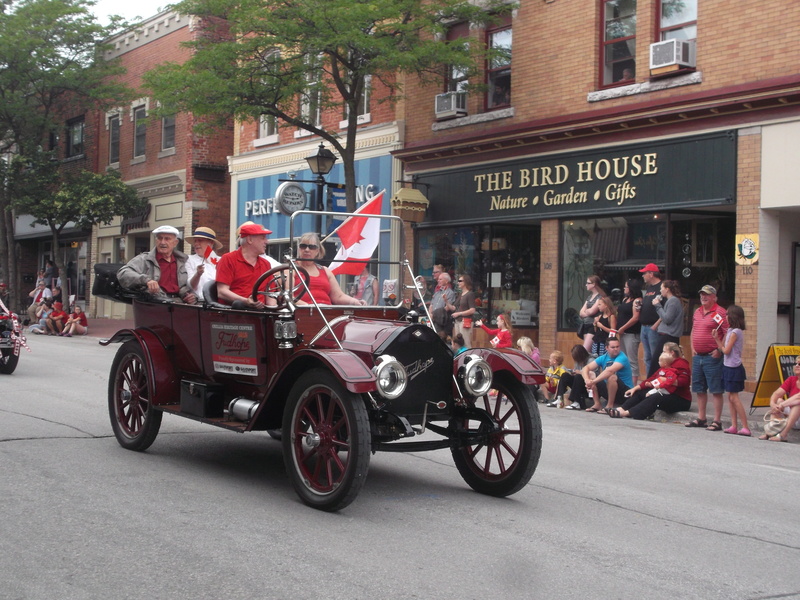 A number of vintage autos formed part of the Canada Day 2015 parade in Orillia, Ontario. 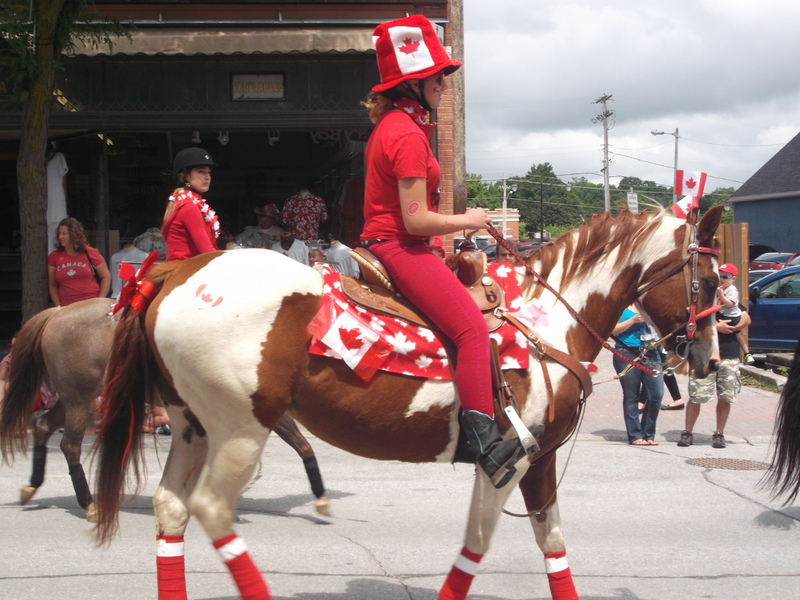 Ponies and horses adorned with riders and flags filled the main street of Orillia during its Canada Day parade. Of course, I am tired! I had Canada Day fever. I was ready for a slice of strawberry-rhubarb pie to celebrate my heritage! as a country girl from Canada! I also enjoyed the Canadian folksongs and down-home atmosphere at Barrie Hill Farms on our way home. It was fun to sing along with the two guitarists, who favoured Neil Young and Gordon Lightfoot (from Orillia) in their repertoire. 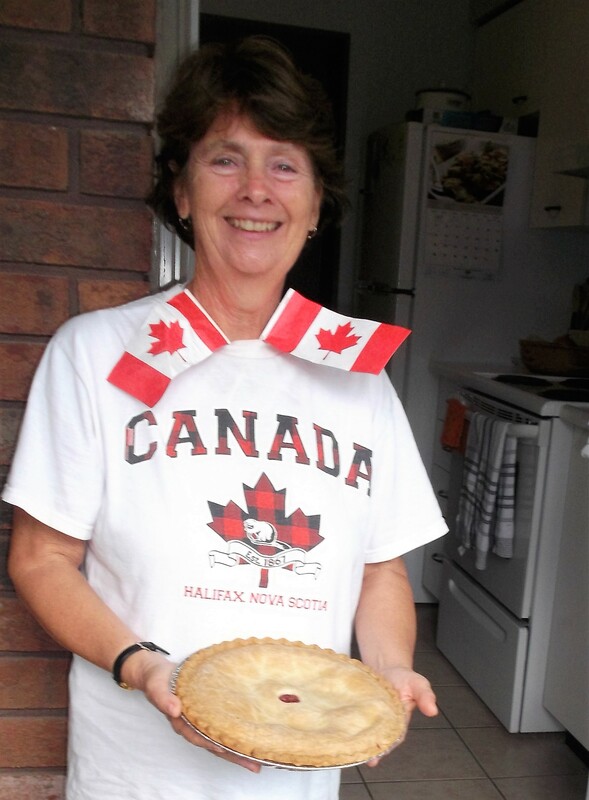 I certainly took a trip down memory lane on Canada Day 2015! 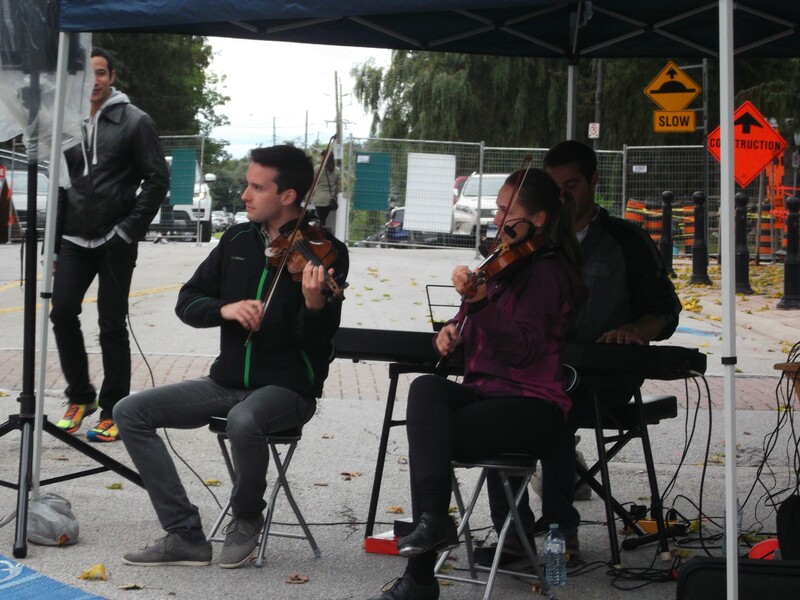 These two musicians provided a pleasant backdrop during a snack stop at the farm market at Barrie Hill Farms. Perhaps most memorable of my prolonged stay with brother Edwin and his wife Beth are the excursions to specific nature sites, all of which were undertaken in fine weather! 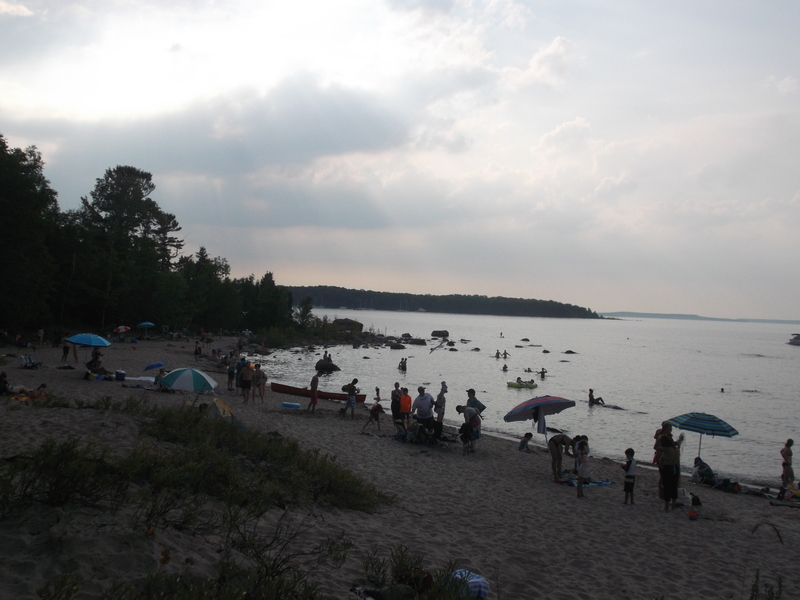 No this is not the Caribbean – it’s Awenda Provincial Park on Georgian Bay near Penetanguishine Ontario. Photo taken by sis-in-law Beth. 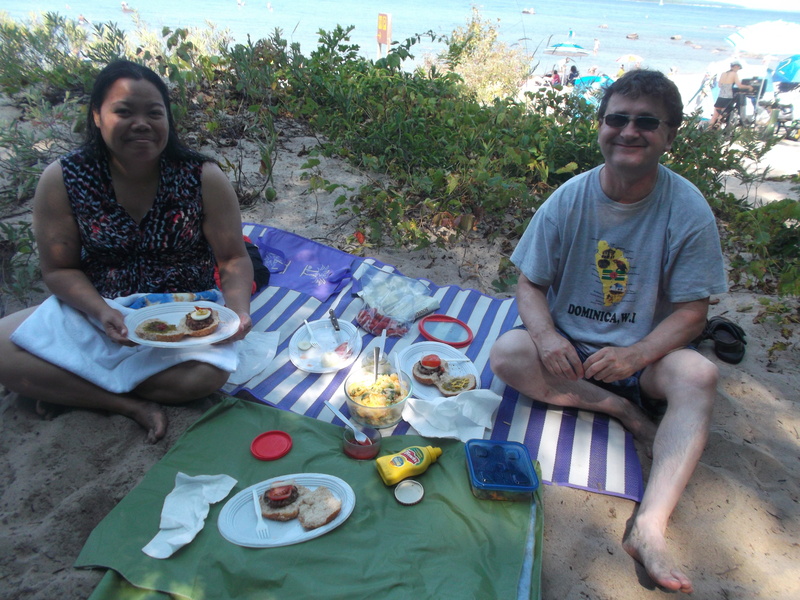 Beth and Edwin enjoy our picnic on a perfect September Saturday at Awenda Provincial Park on Georgian Bay. What a day to be on the beach at Awenda Provincial Park on Georgian Bay near Penetanguishene Ontario. 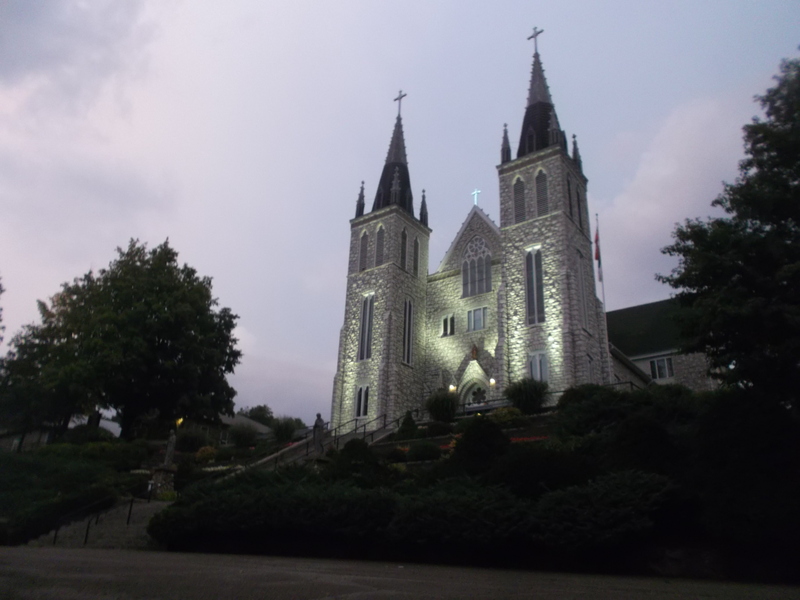 The Martyrs’ Shrine near Midland Ontario is stunning in the evening light of summer. It honours 8 Jesuit Saints who lived and died there over 350 years ago. we stopped at Mom’s Restaurant in Midland Ontario for coffee and home-made dessert. Then we drove through the grounds at the Martyrs’ Shrine, across the road from the St. Marie Among the Hurons historic site, This area played a significant role in Canadian history as Ontario’s first European community, dating back to the early 17th century! 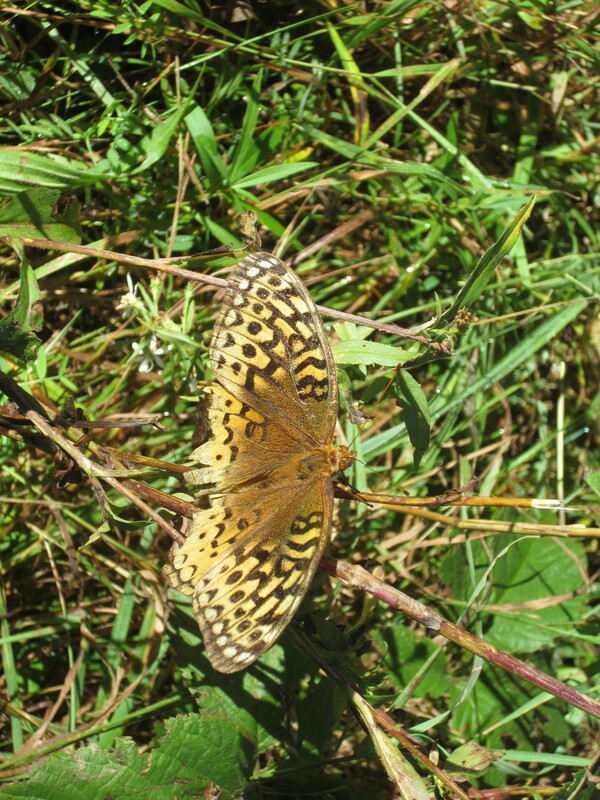 This butterfly doesn’t seem to be in a hurry to leave for the winter on that warm, sunny day. Photo by Edwin Whitford. 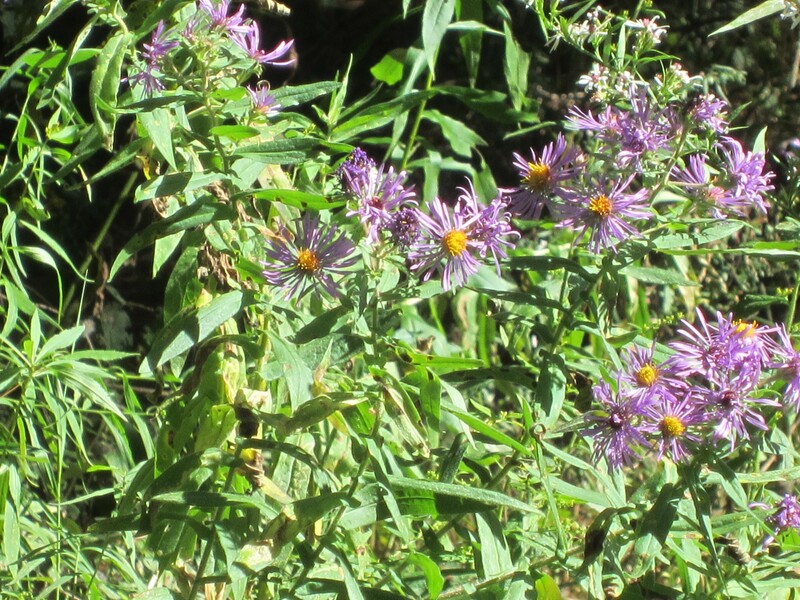 Pretty wildflowers lined the path as we entered Nottawasaga Conservation Area. Photo by Edwin Whitford. 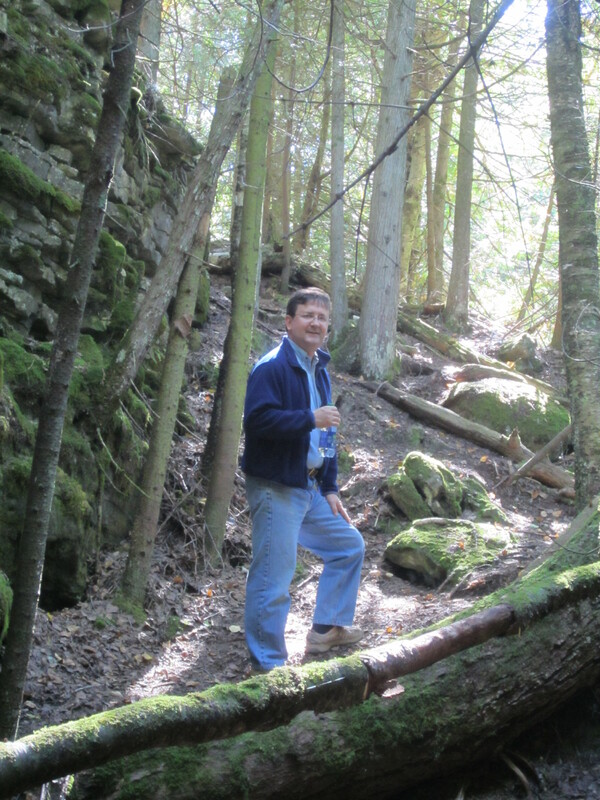 I caught Edwin going up the trail, as I stopped to take in the lovely forest on the Niagara Escarpment. Peek-a-boo! The air was cool and damp in those deep crevasses. Photo taken by Edwin. 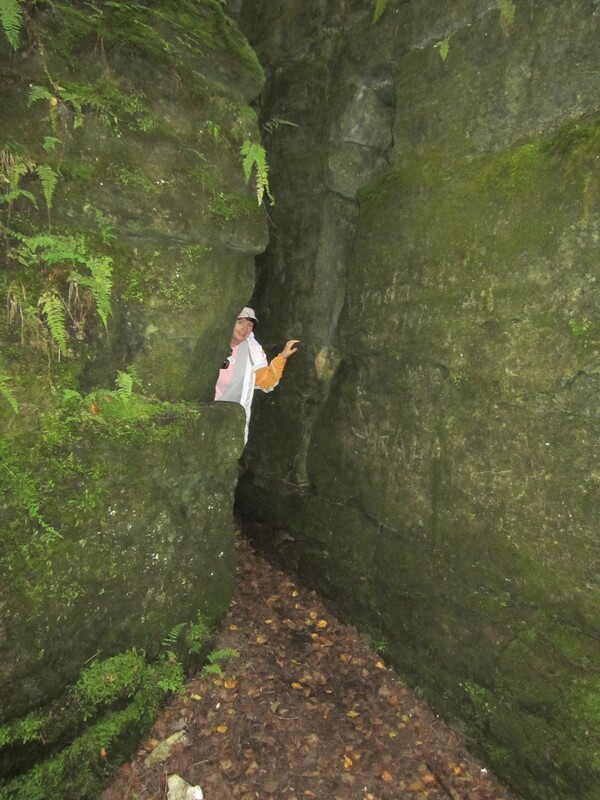 It was fun to walk down the narrow chasm on this part of the historic Bruce Trail, which intersects with Nottawasaga. Photo by Edwin Whitford. scenic Niagara Escarpment (see photo at top). I breathed deeply of pure fresh air, and noted the subtle colour changes in the leaves, signalling summer’s end – but not on that spectacular day! 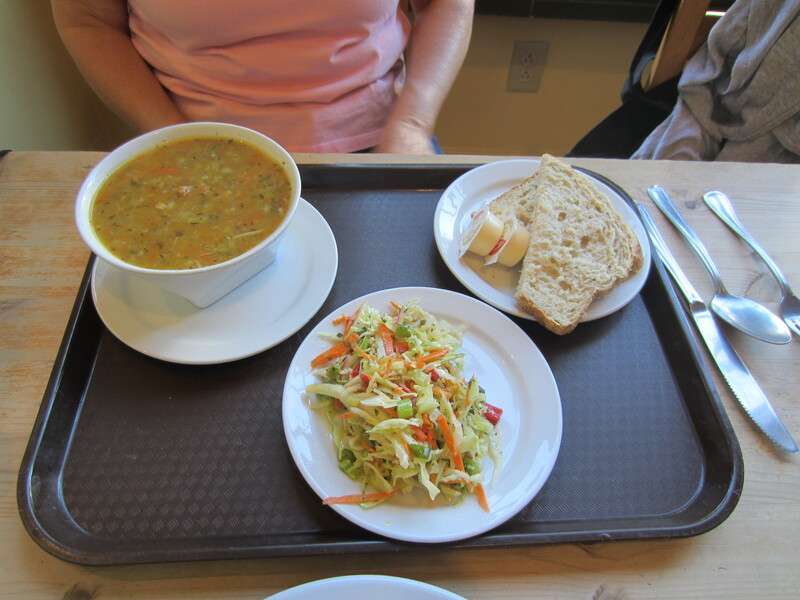 Chicken soup, home-baked bread and crispy coleslaw. A perfect post-hike snack! Photo taken by Edwin. 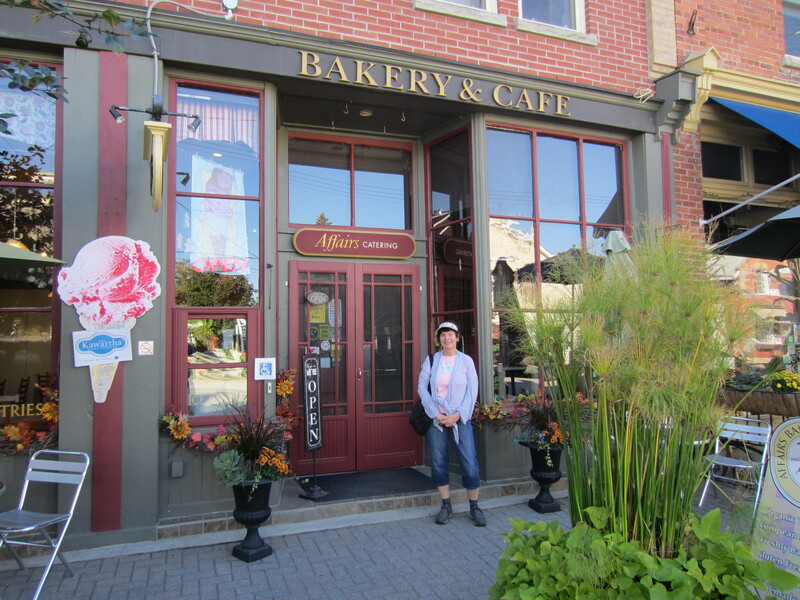 I can’t wait to return to the Affairs Bakery and Cafe in Creemore Ontario. Photo taken by Edwin. What a fitting finale for my long, lovely summer in eastern Canada. And I’ve yet to tell you about all the other adventures over my three and a half months. Lots more to come! Now that I’ve got your attention…Stay tuned for the continued adventures of Canary Gal in Canada in the summer of 2015! (Photo taken at Awenda Provincial Park, Georgian Bay Ontario. A Walk Up to Cochrane Dominica: Hot Farms, Warm Friends and Cool Mountains!